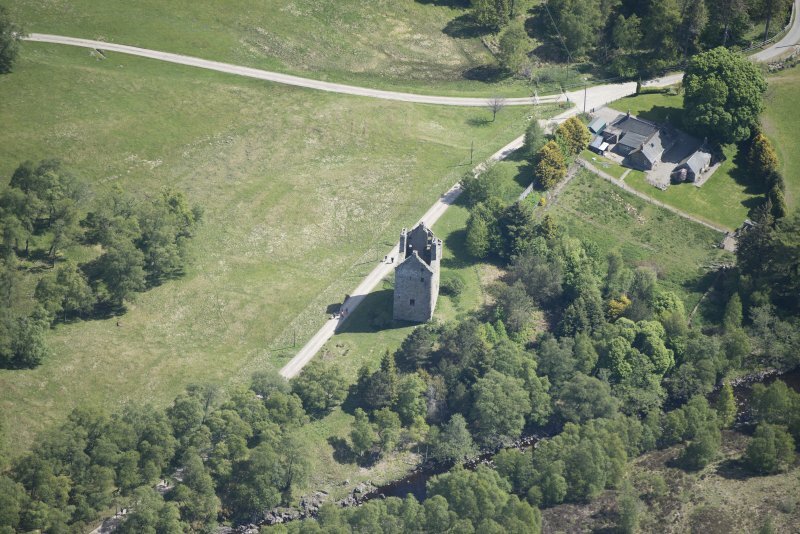 Oblique aerial view of Invermark Castle, looking NE. 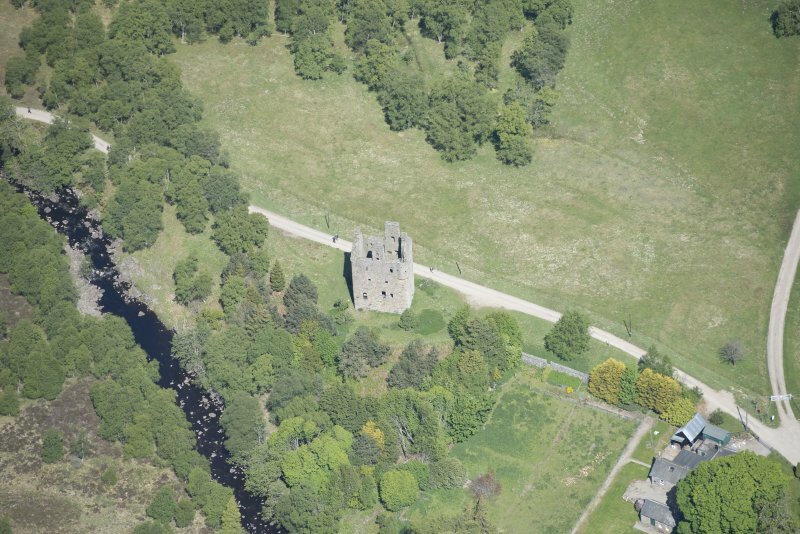 Oblique aerial view of Invermark Castle, looking E.
Plane-table survey of the area immediately surrounding Invermark Castle. 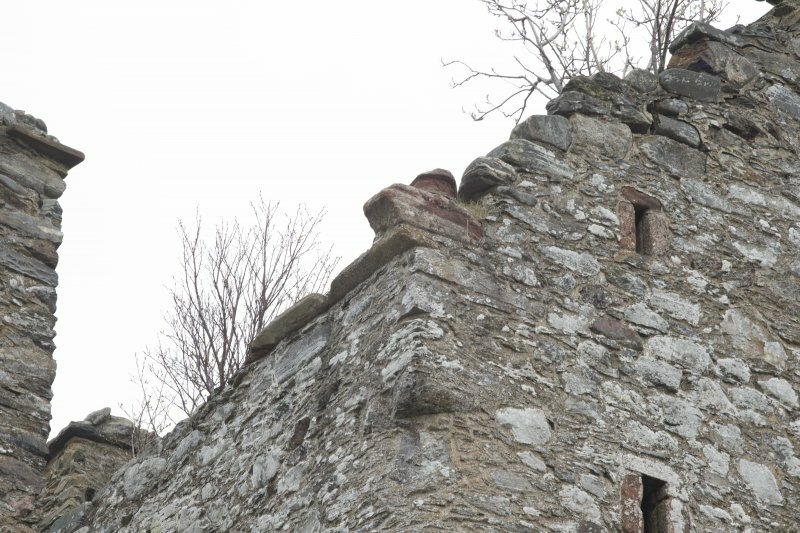 Cropped scan of DC 57646. 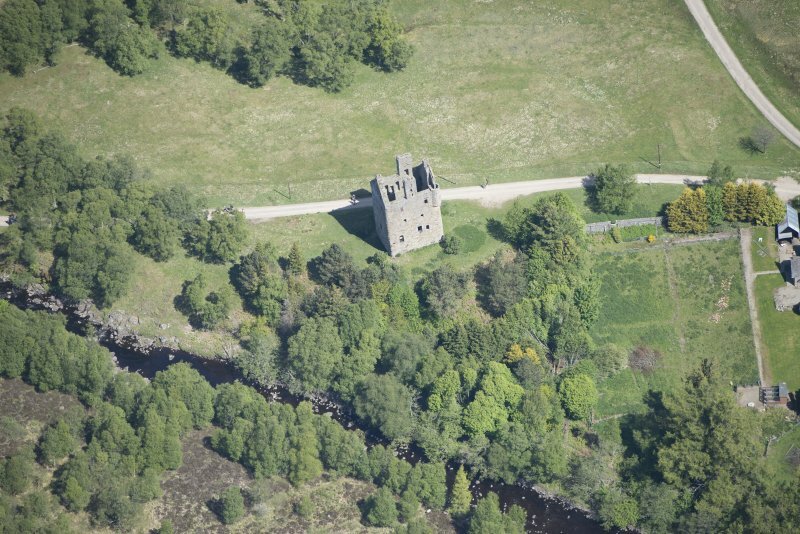 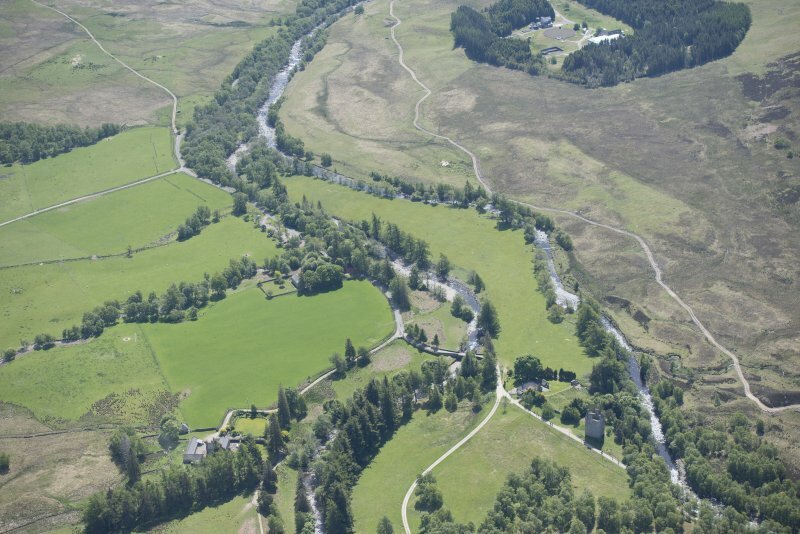 Oblique aerial view of Invermark Castle, looking ESE. 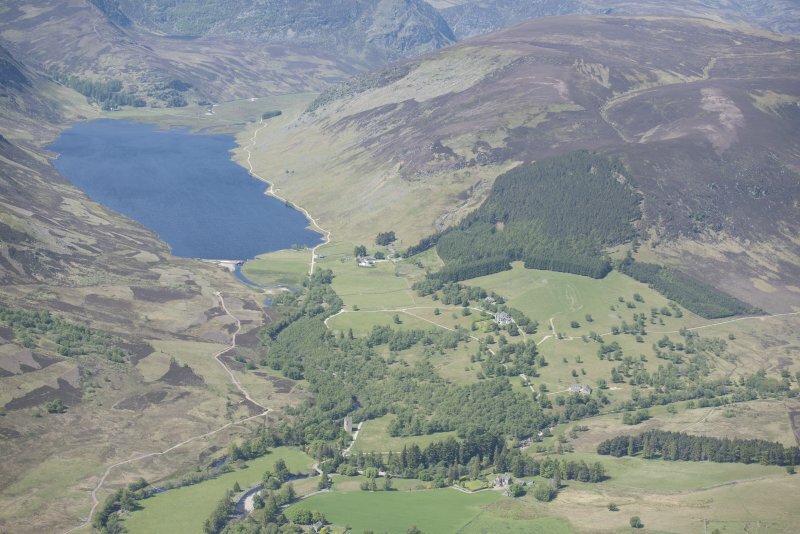 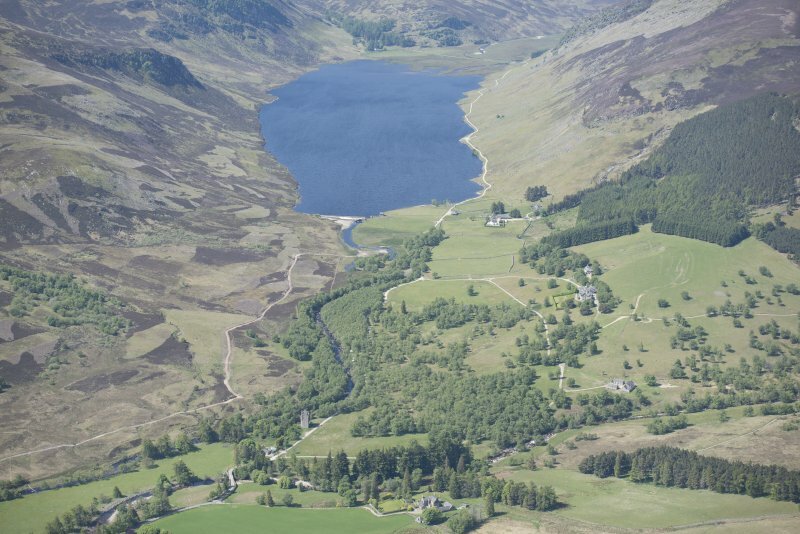 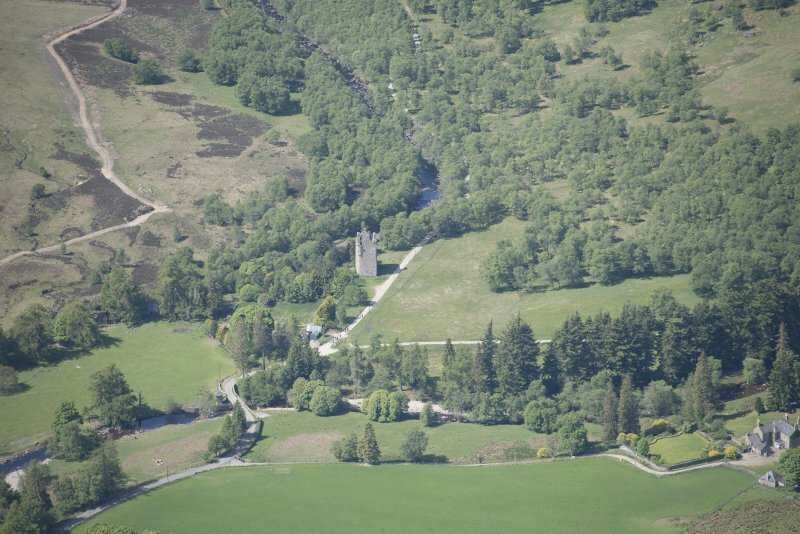 General oblique aerial view of Lochlee with Invermark Castle in the foreground, looking WSW. 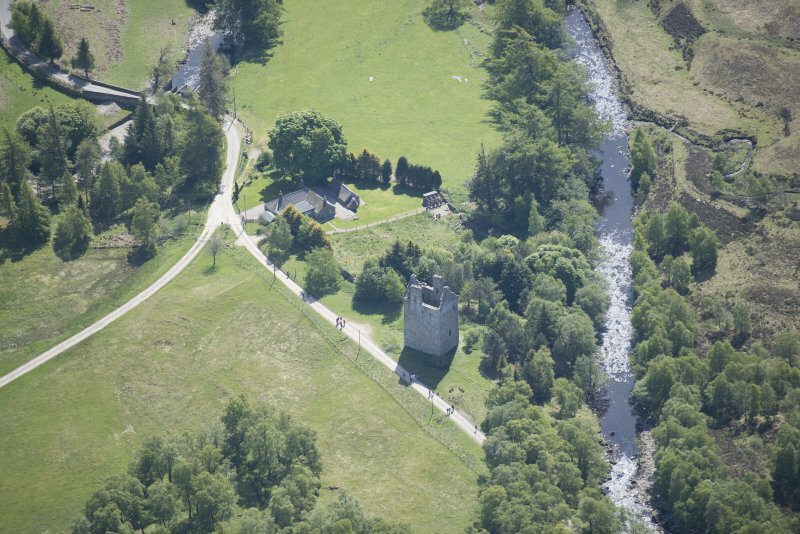 Oblique aerial view of Invermark Castle, looking WNW. 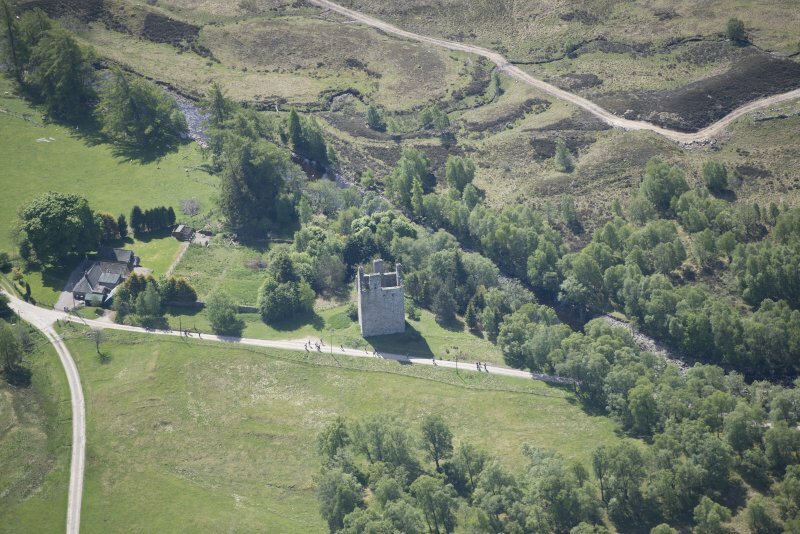 Oblique aerial view of Invermark Castle, looking NW. 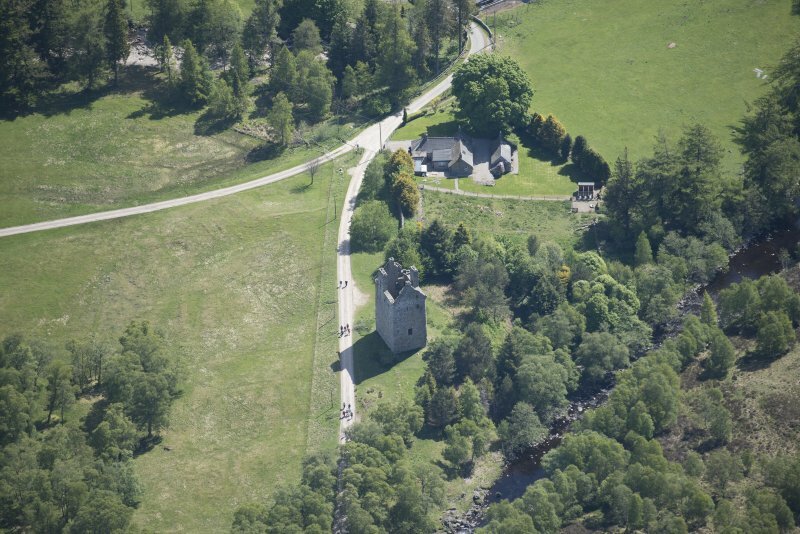 Oblique aerial view of Invermark Castle, looking NNE. 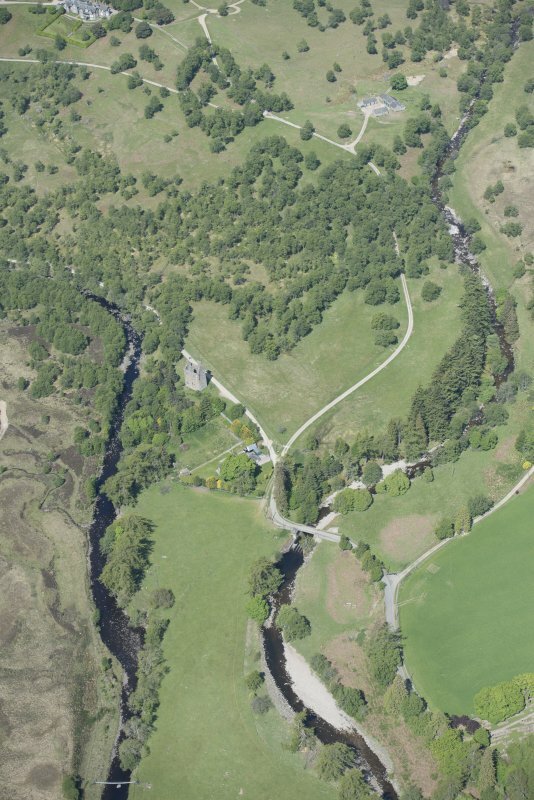 Oblique aerial view of Invermark Castle, looking W.
General oblique aerial view of Lochlee with Invermark Castle in the foreground, looking W.
Oblique aerial view of Invermark Castle, looking SE. 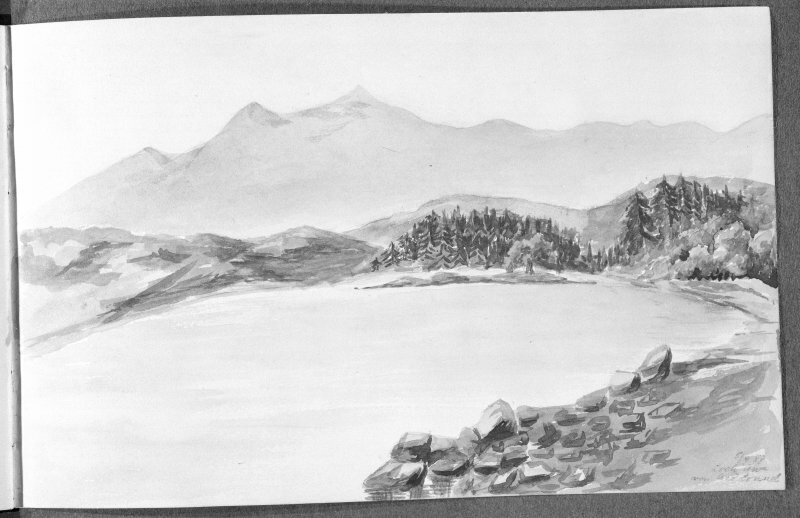 Photographic copy of watercolour showing general view of castle. 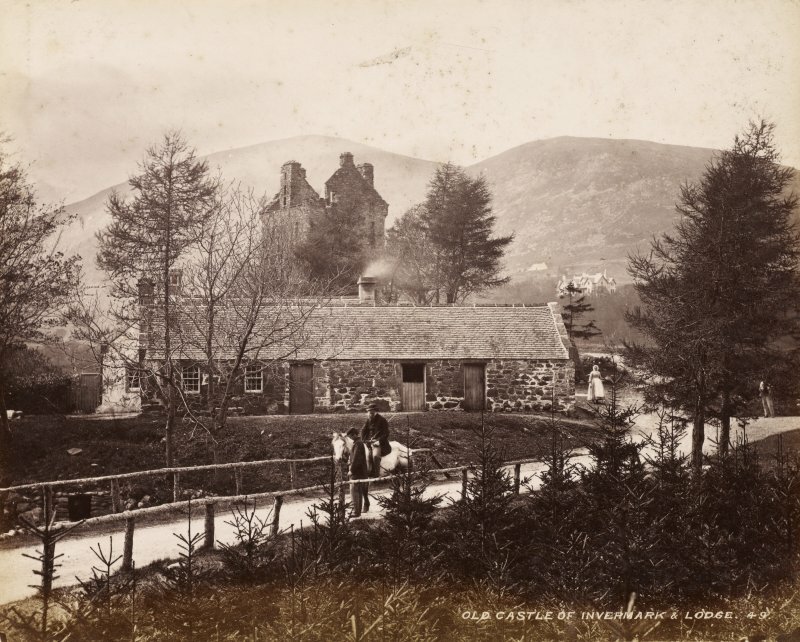 View of Invermark Castle and lodge with figures. 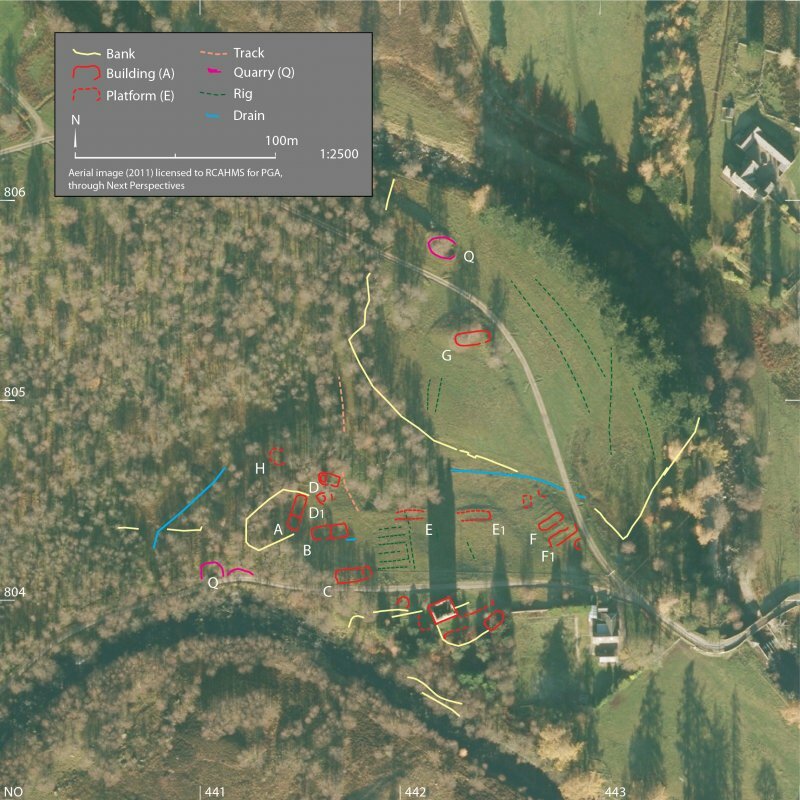 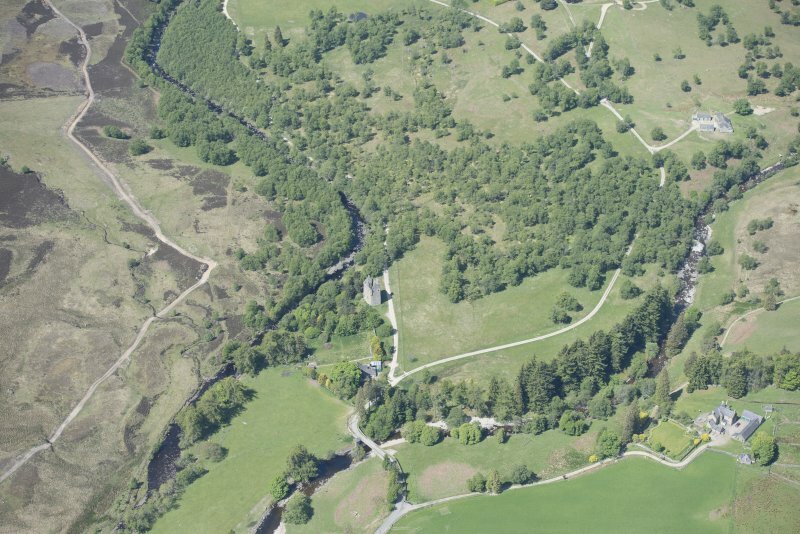 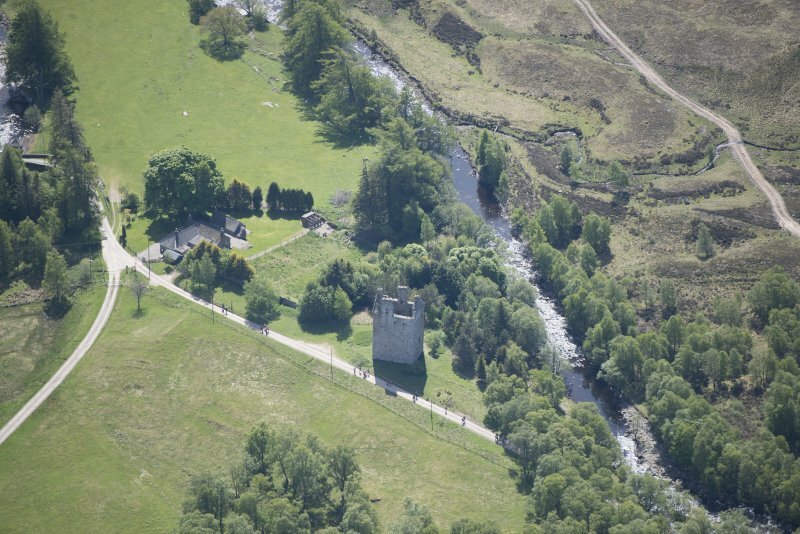 Oblique aerial view of Invermark Castle, looking ENE. 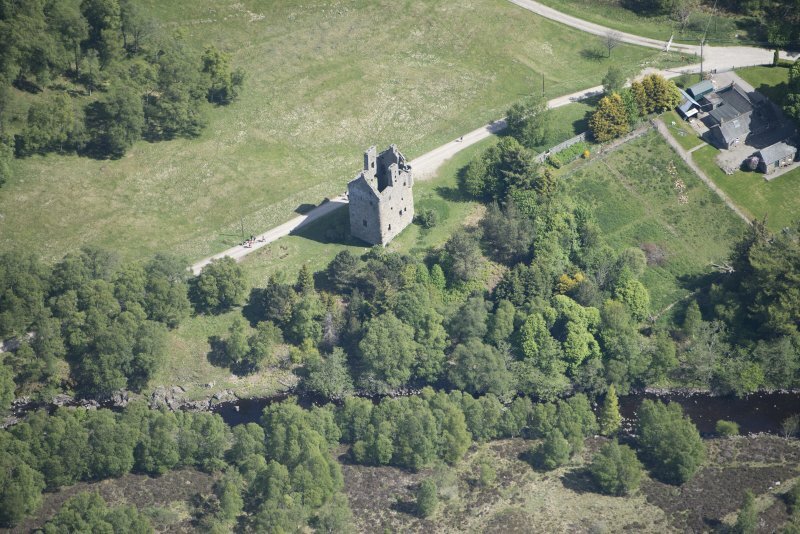 Oblique aerial view of Invermark Castle, looking SSE. 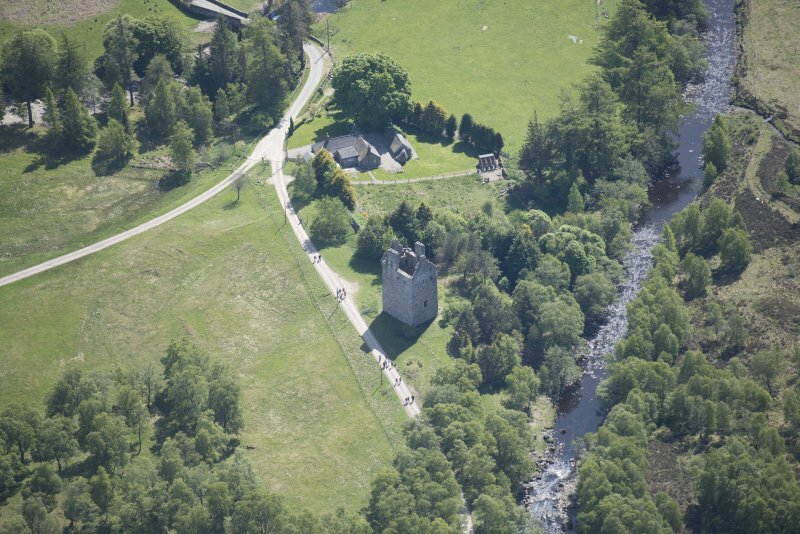 Oblique aerial view of Invermark Castle, looking NNW. 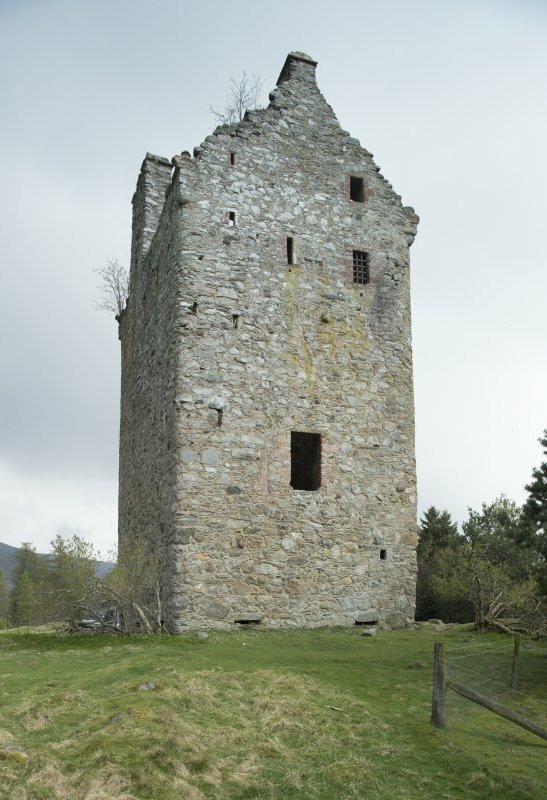 Invermark Castle. 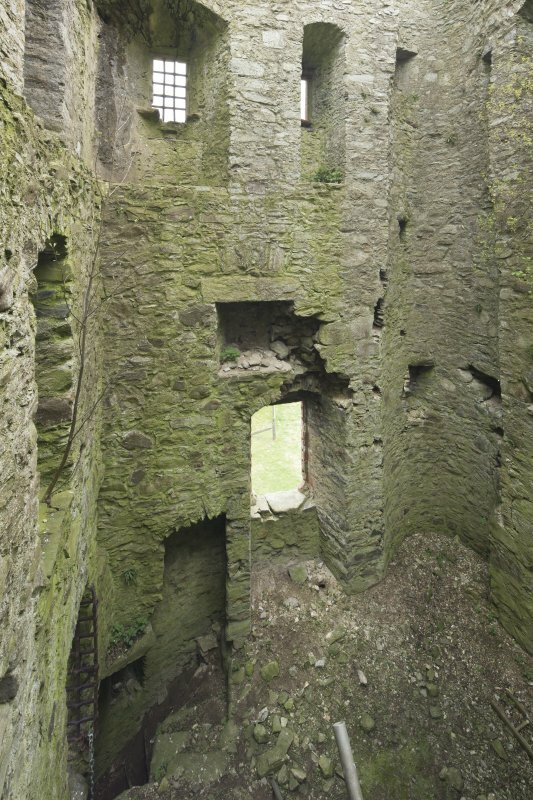 Distant view from the W.
The remains of the tower which is roofless, are in good condition. 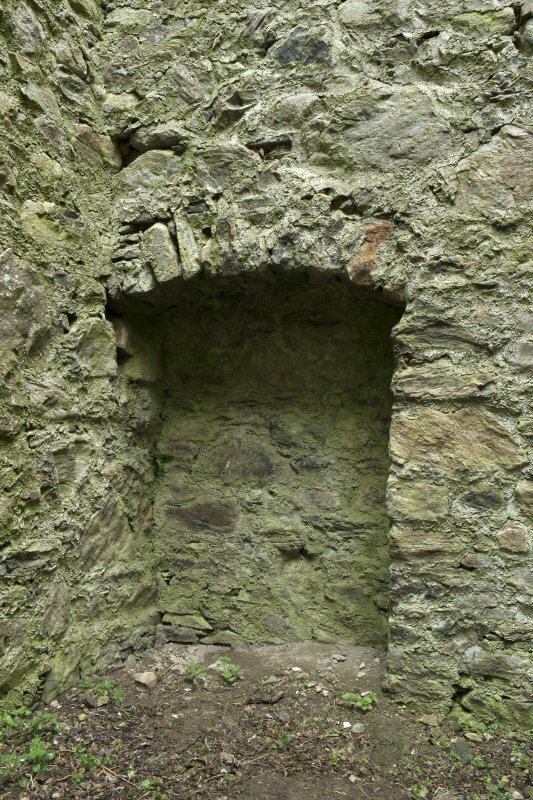 The foundations to the south and east are fragmentary and may be later. 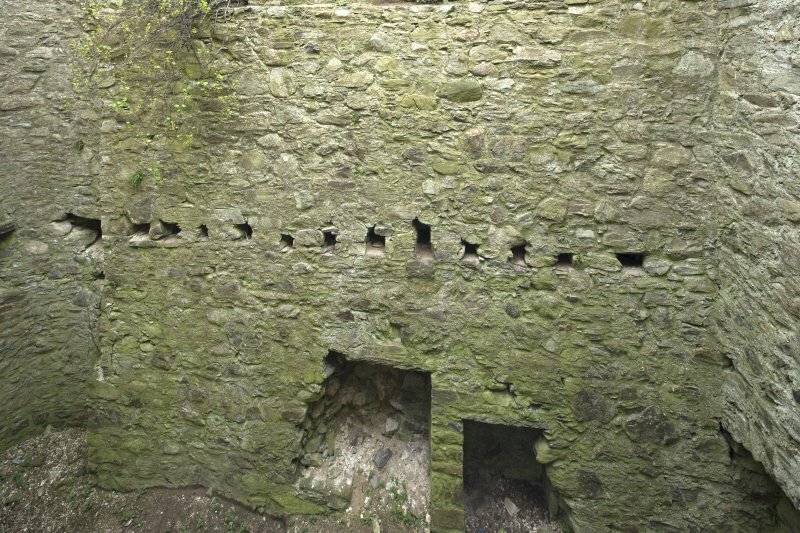 They appear as a turf-covered wall spread to 1.2m and 0.2m high. 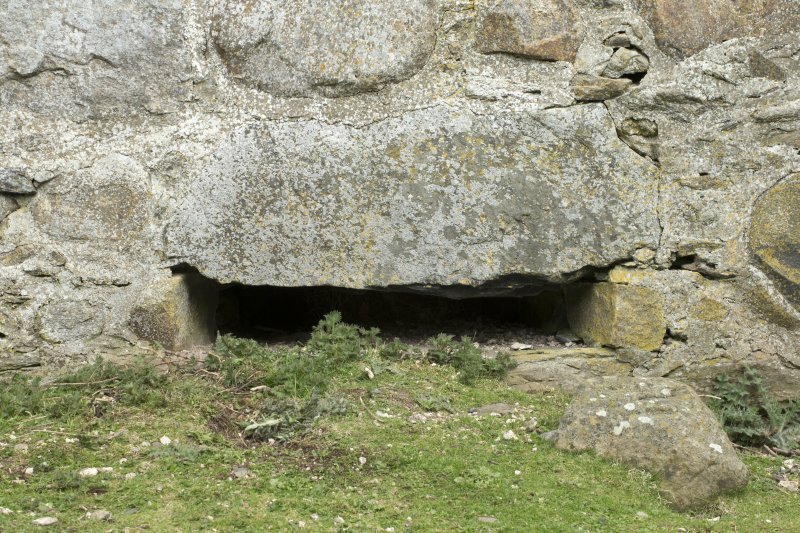 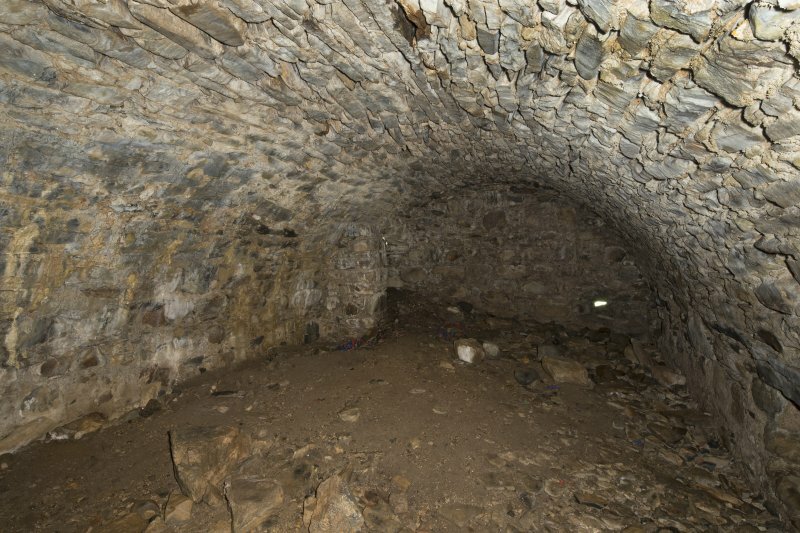 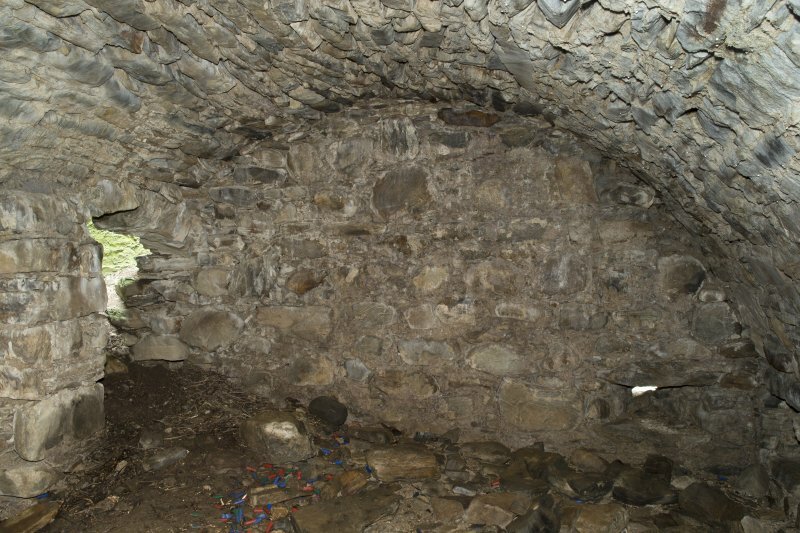 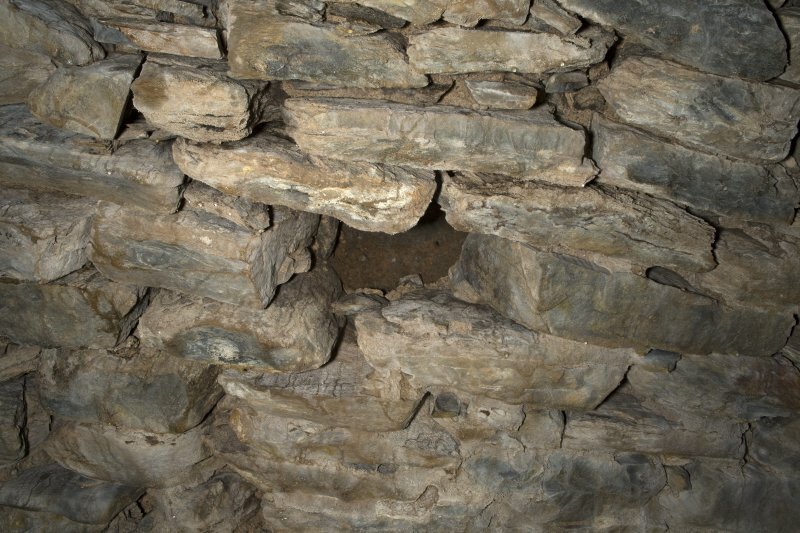 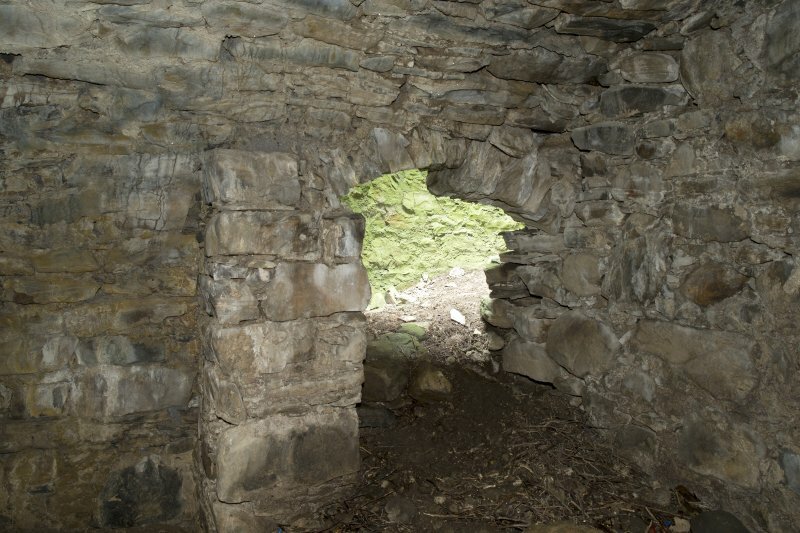 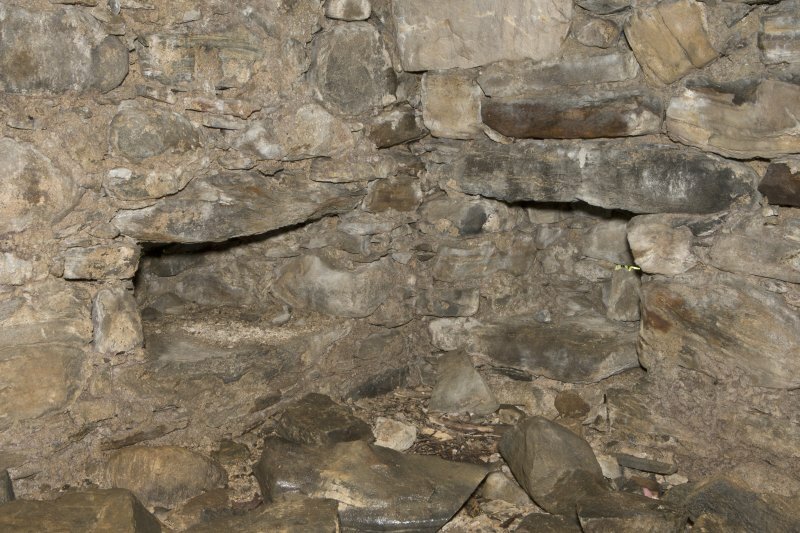 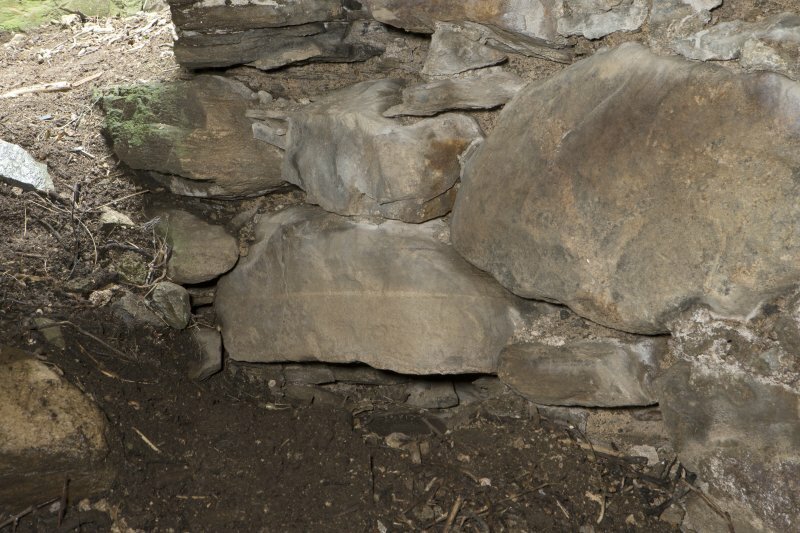 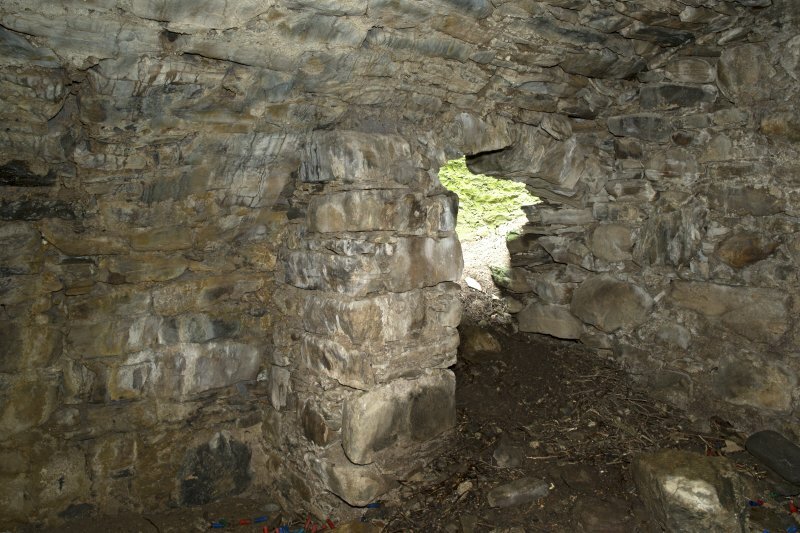 The south fragment may be the foundation of the structure mentioned by Jervise in front of the entrance. 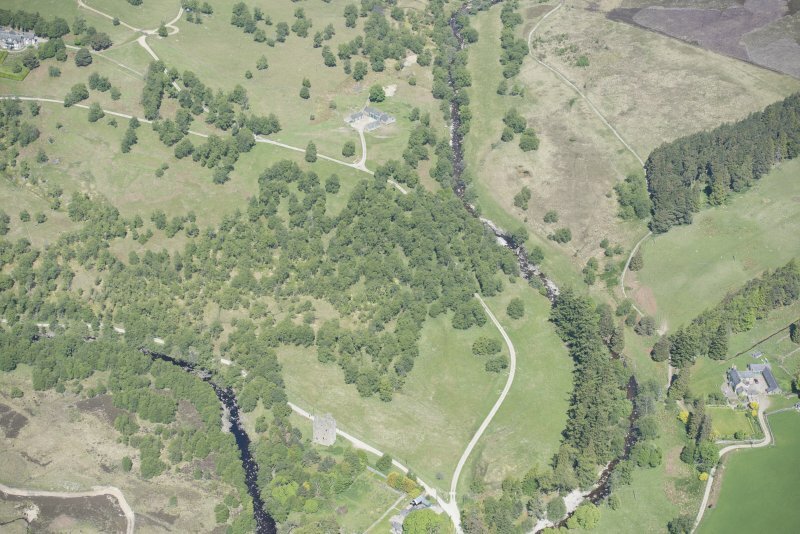 There is now only a faint suggestion of the track running west. 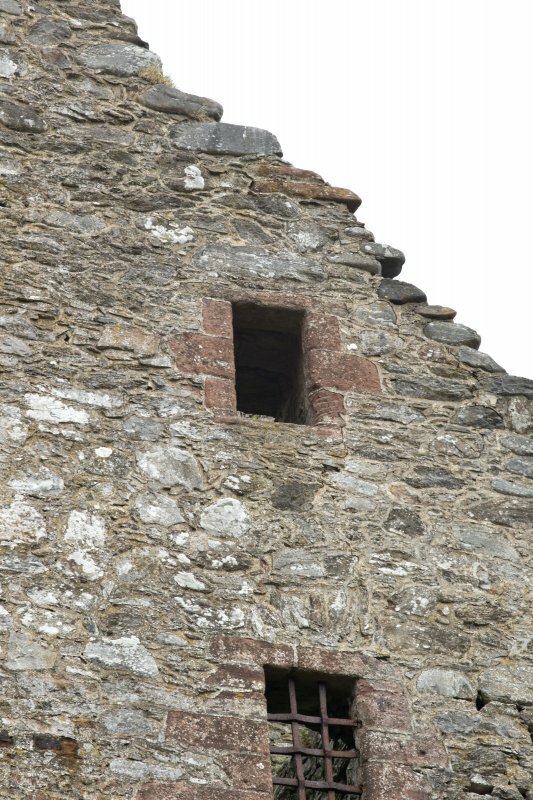 Visited by OS (J L D) 31 July 1958. 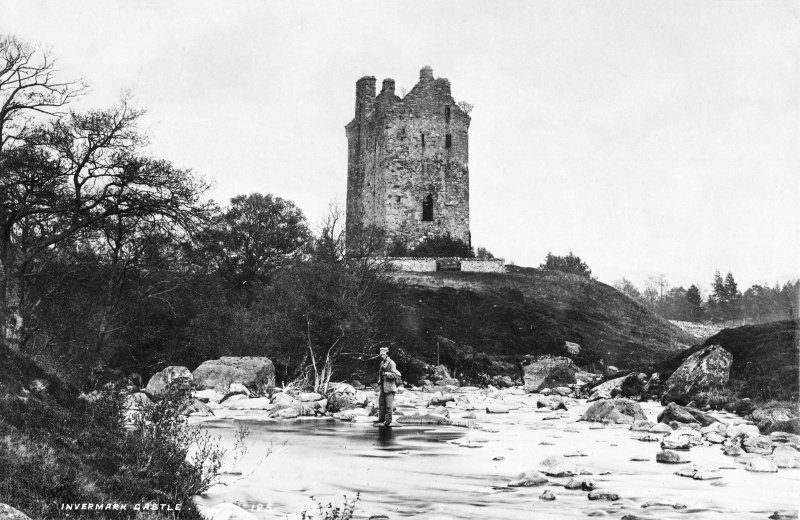 Two photos on record card. 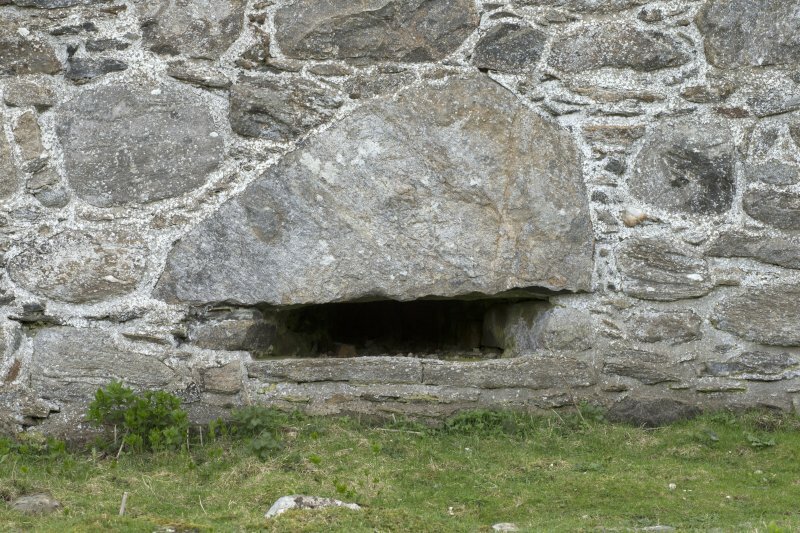 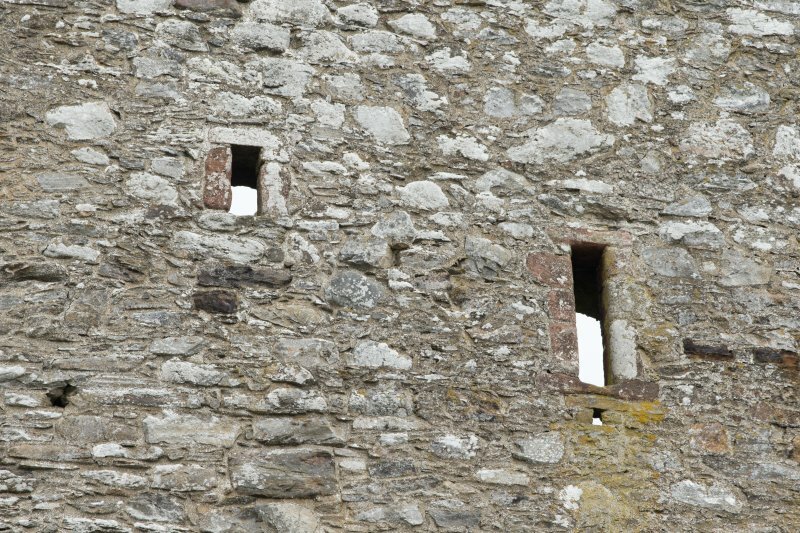 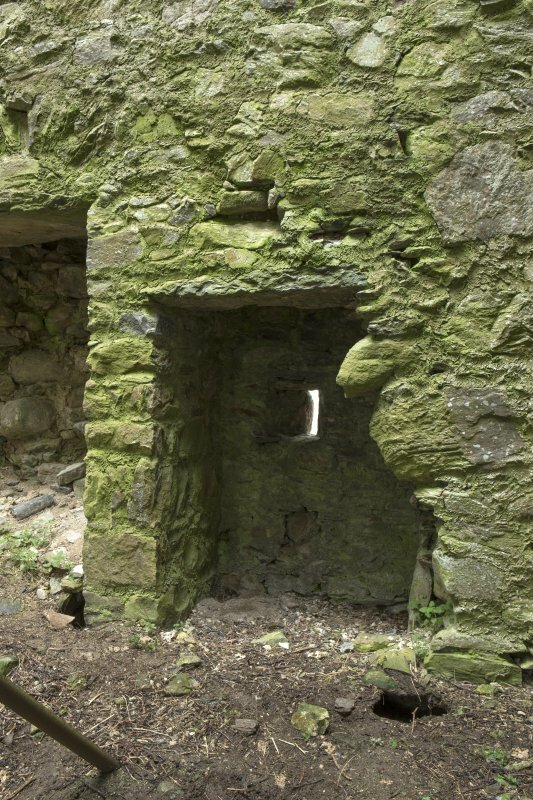 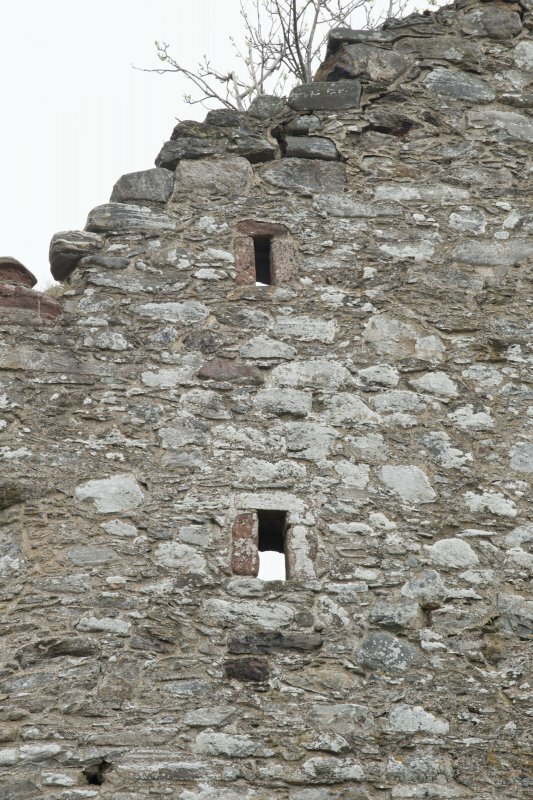 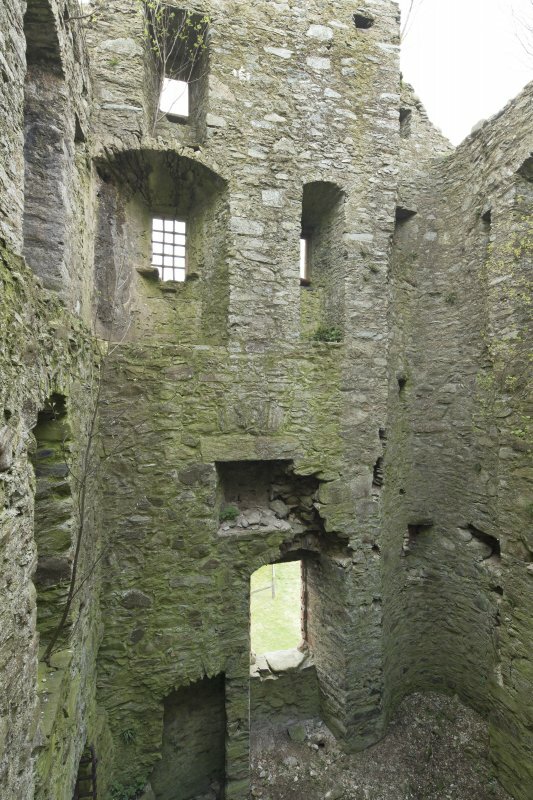 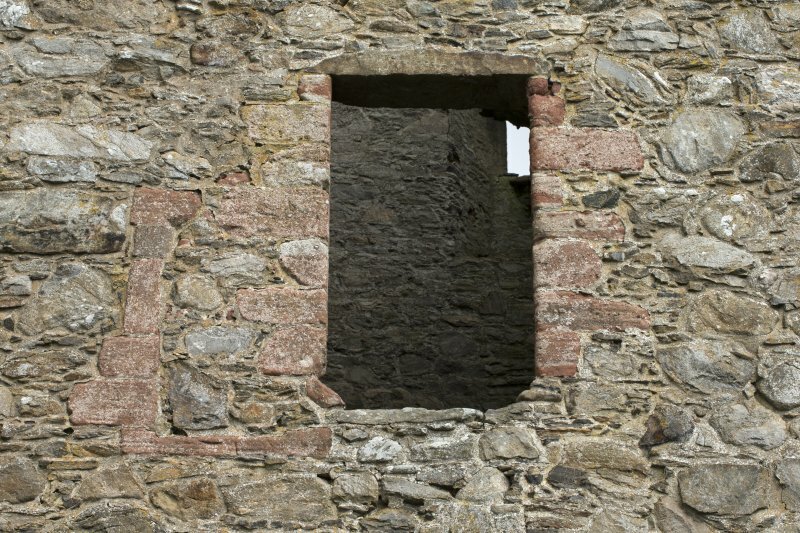 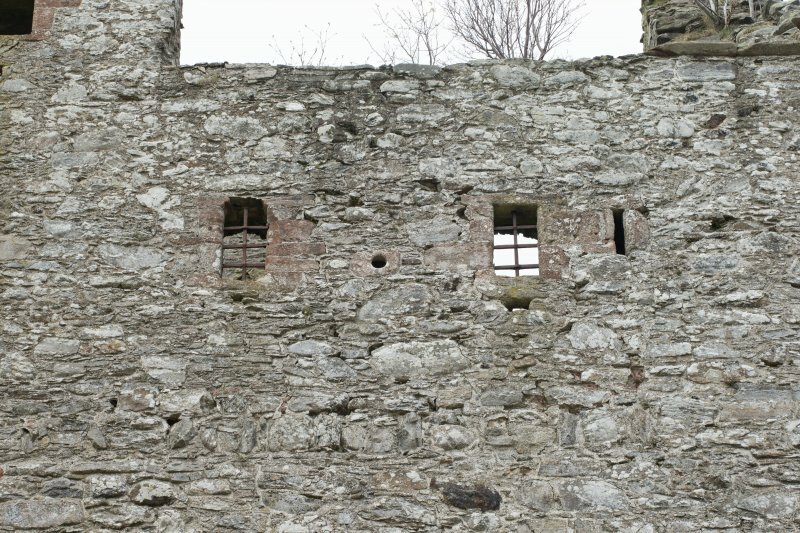 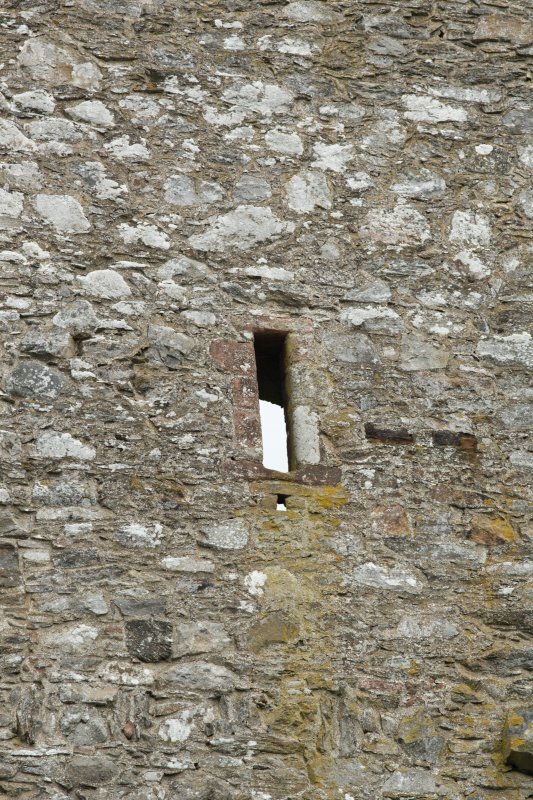 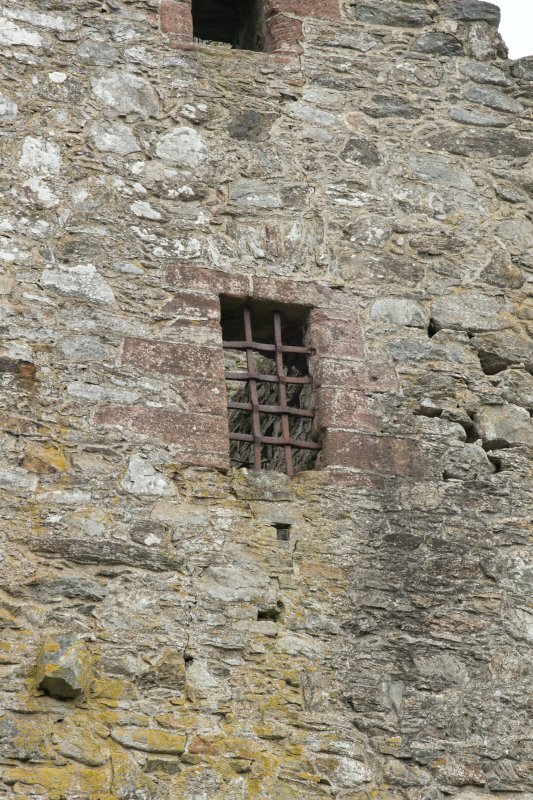 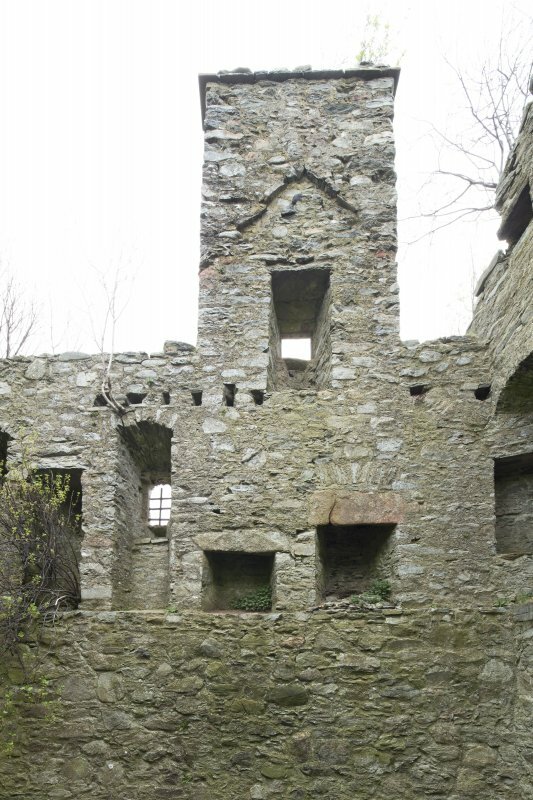 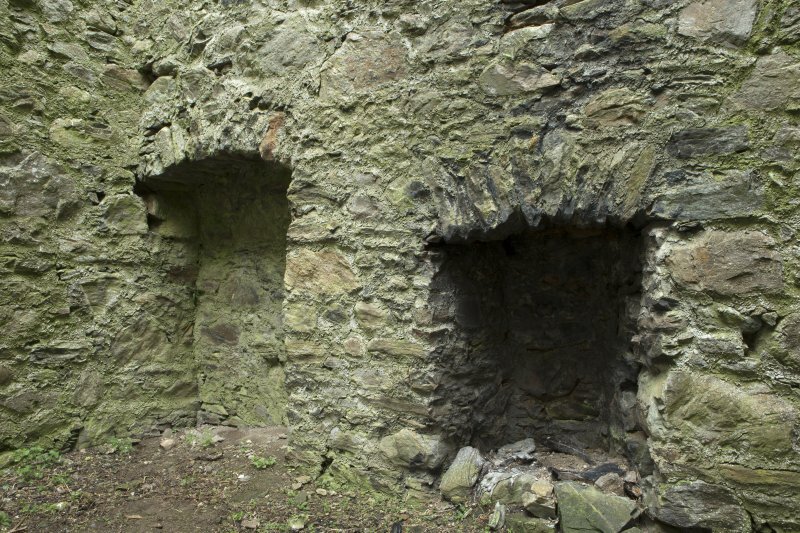 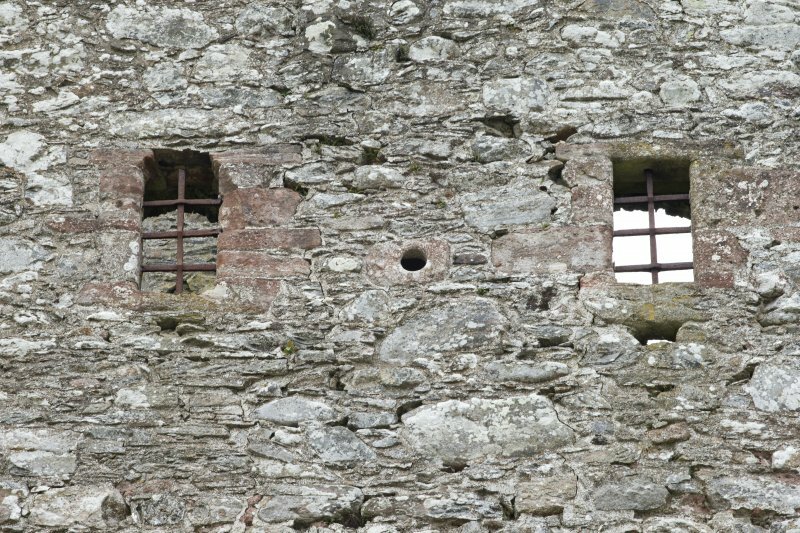 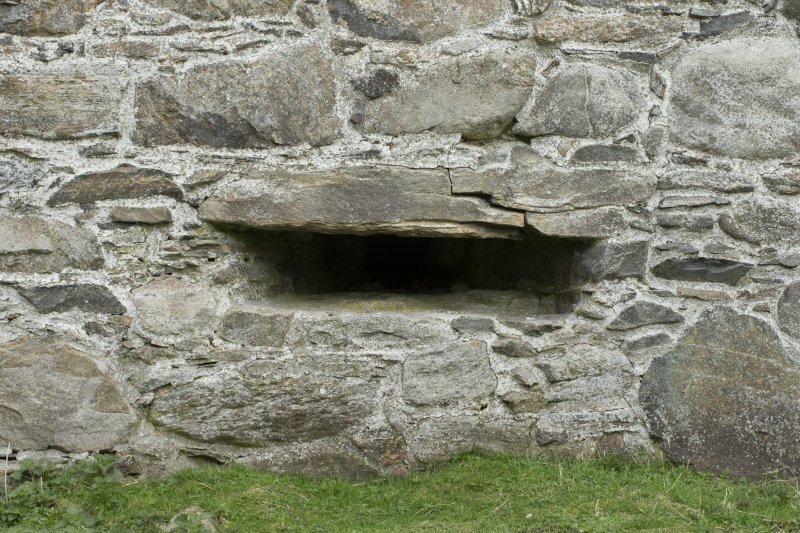 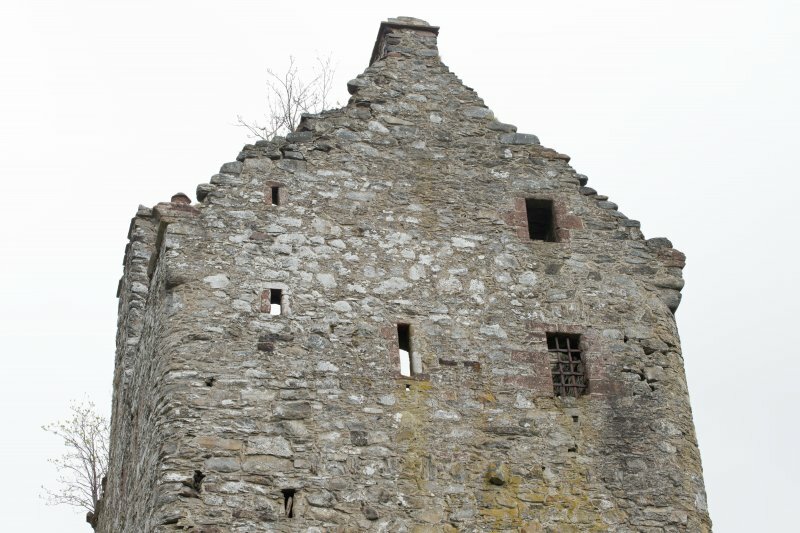 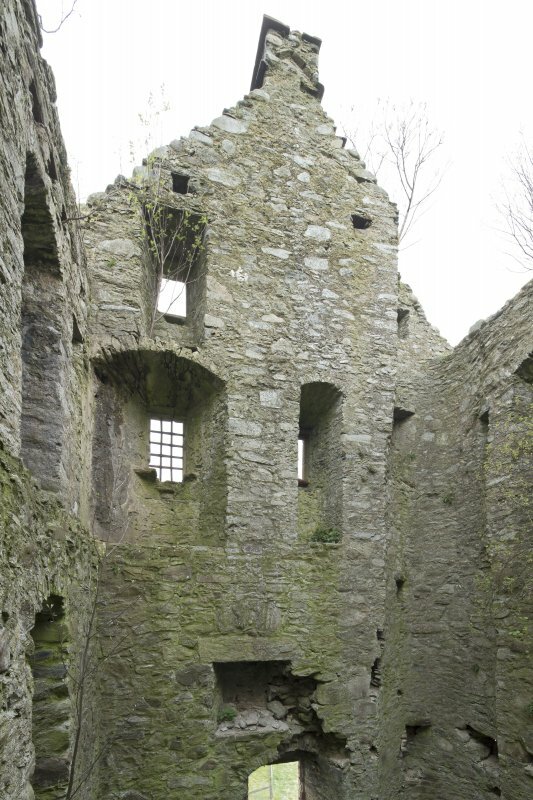 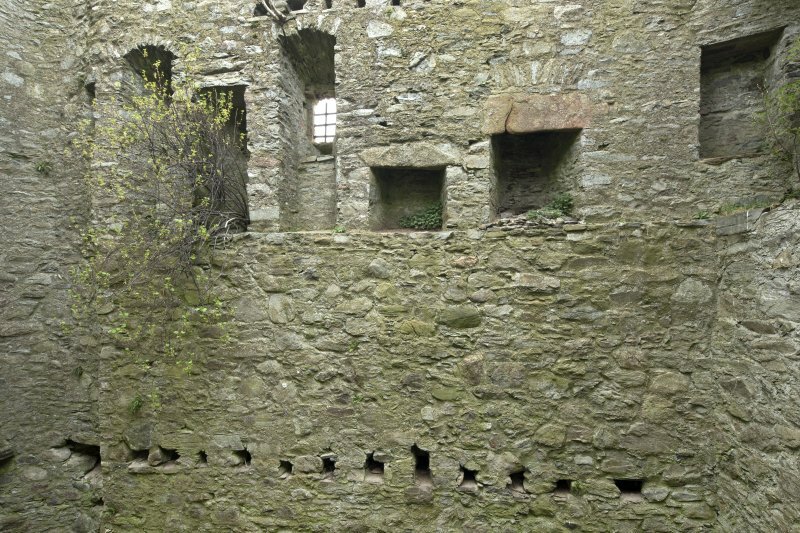 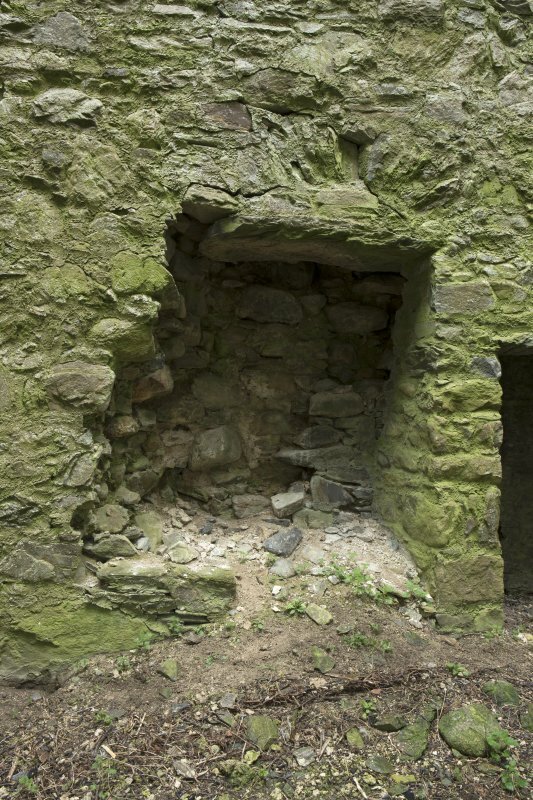 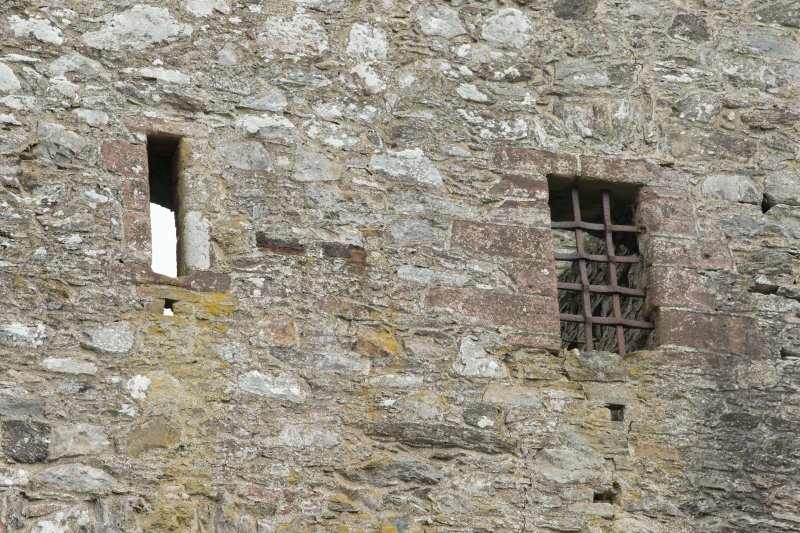 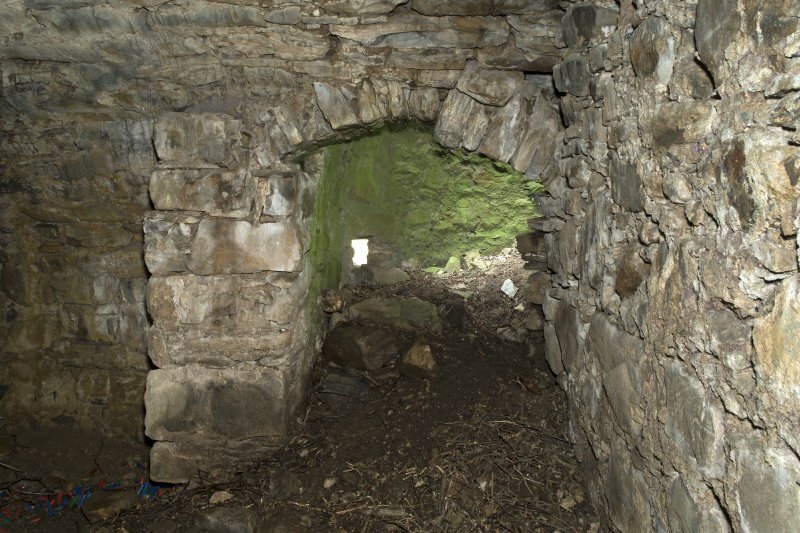 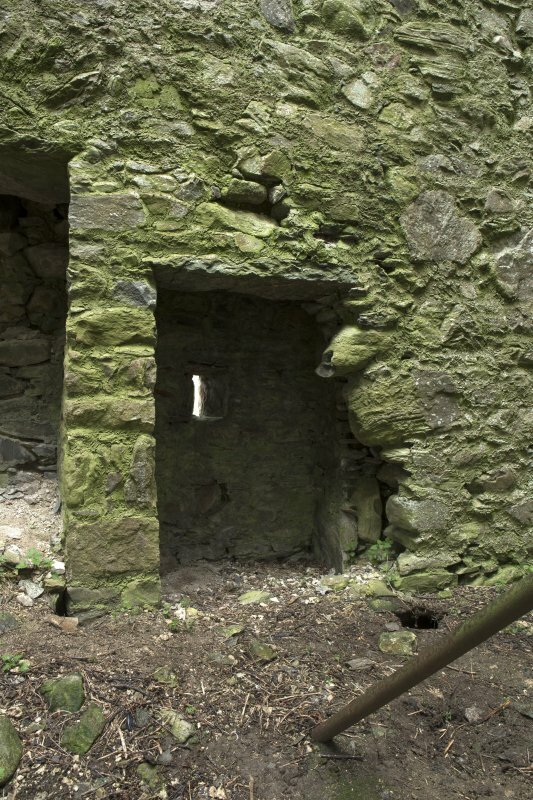 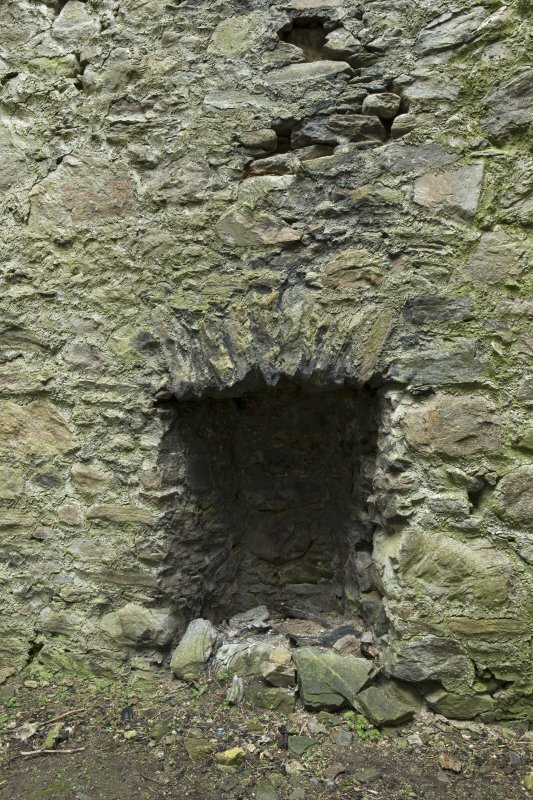 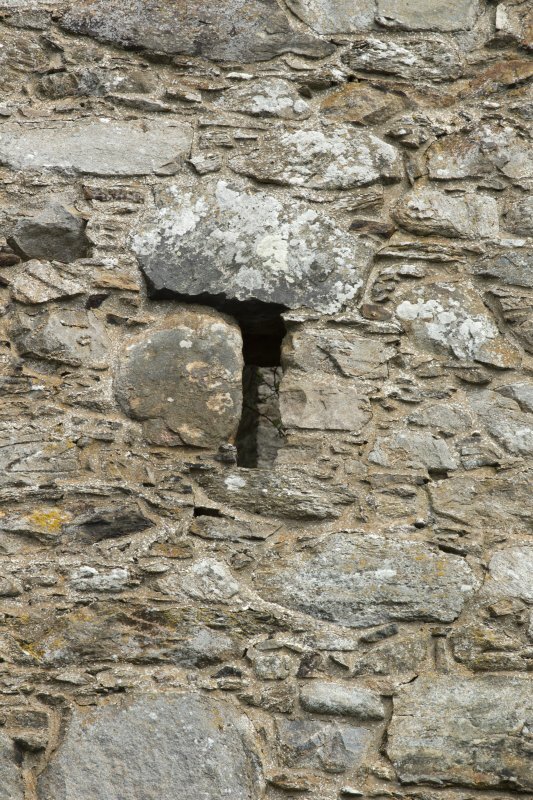 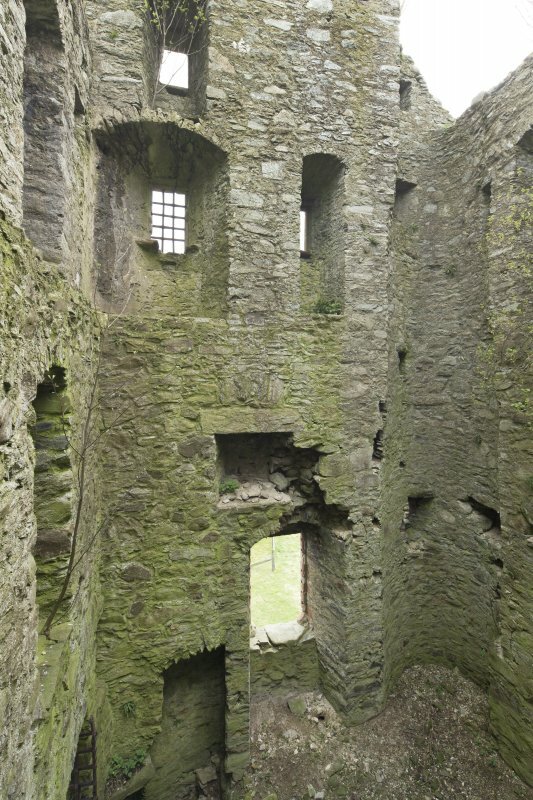 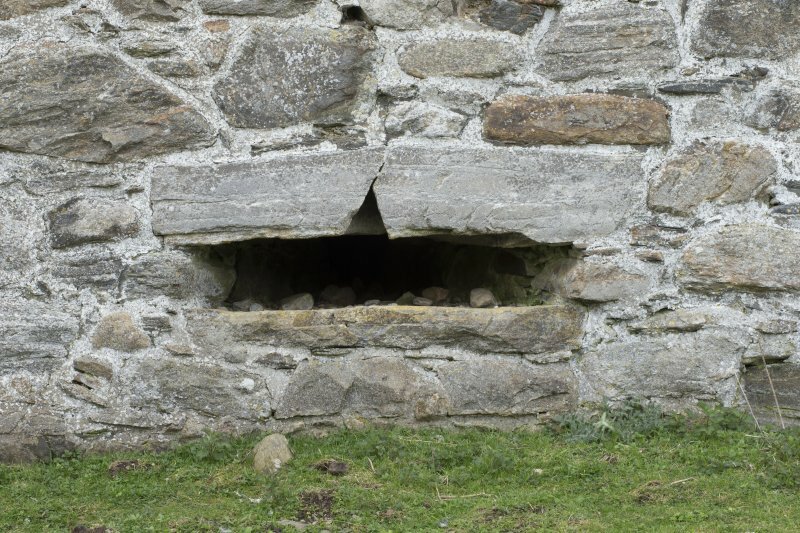 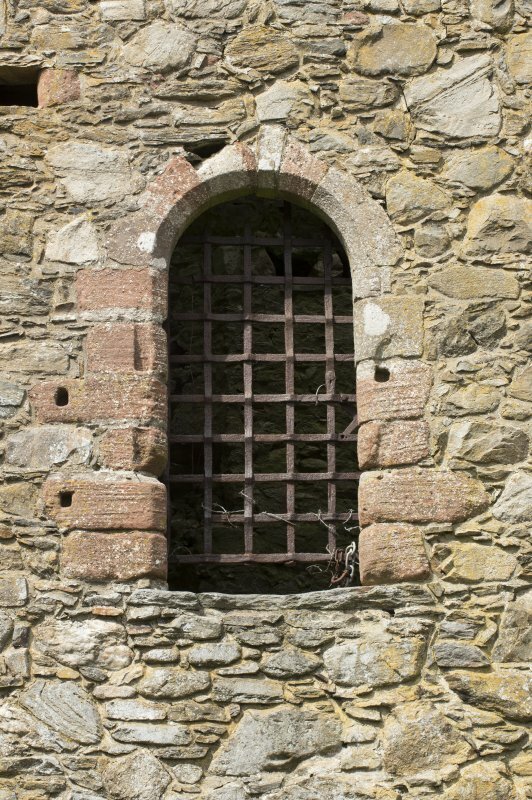 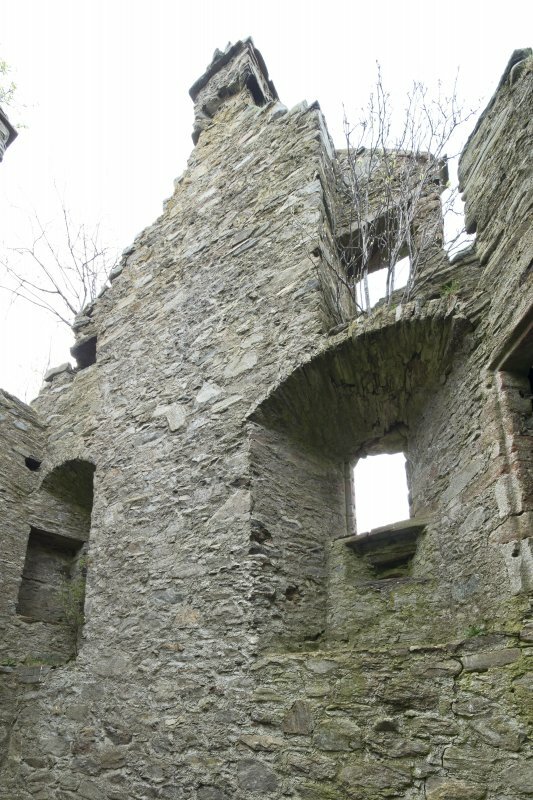 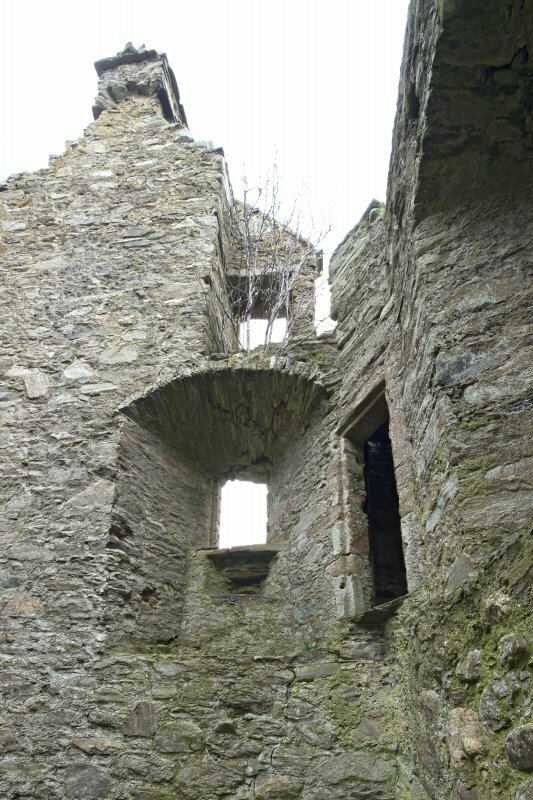 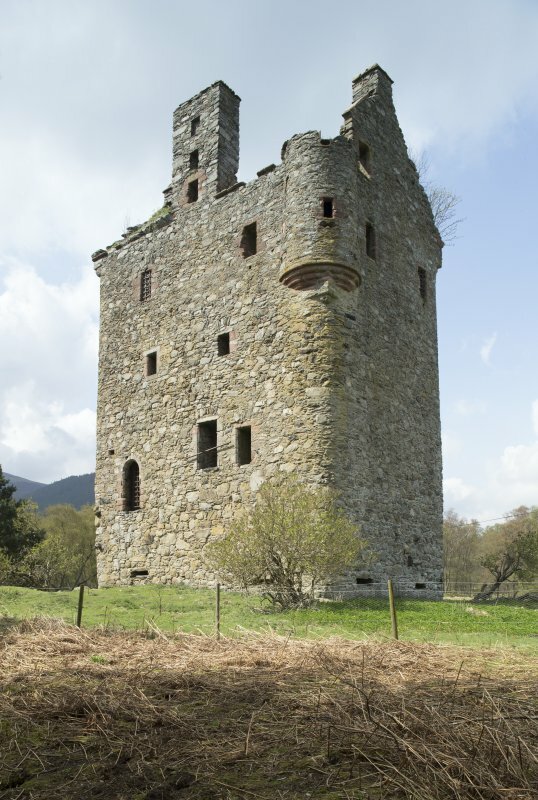 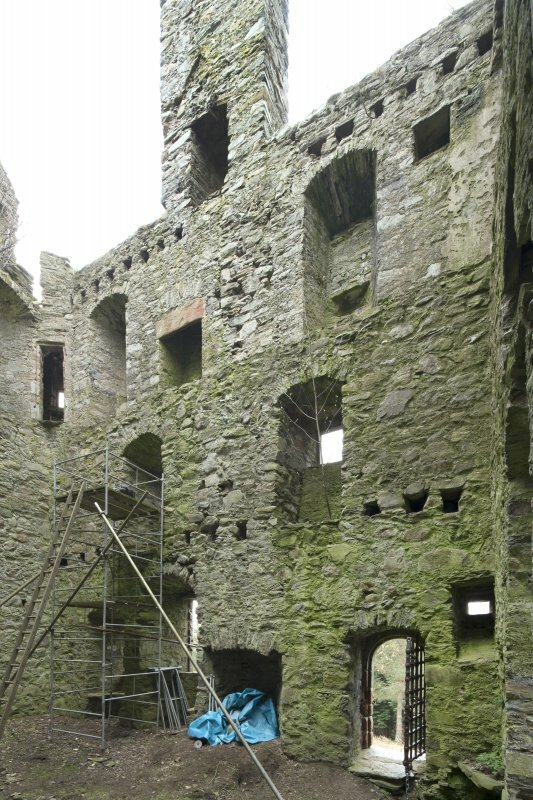 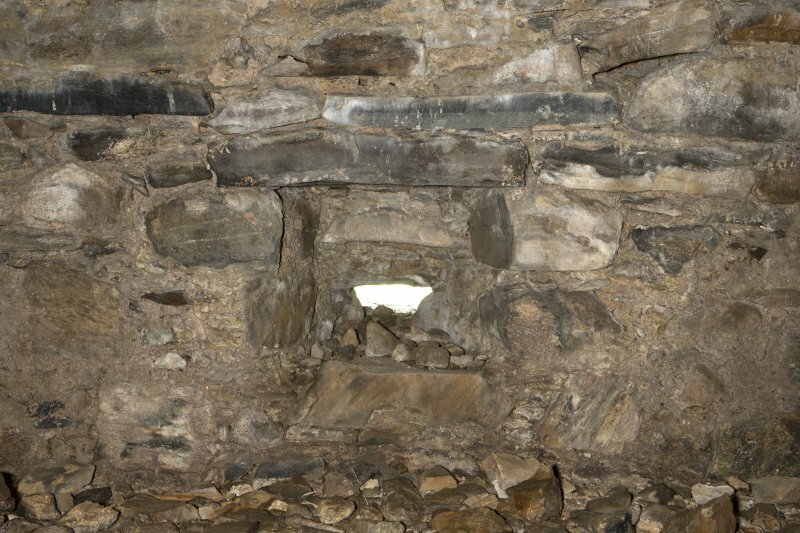 The remains of Invermark Castle now consist of a tower, 4 storeys in height and a garret, whose architectural detail suggests two periods of construction - below the second floor belongs to the first half of the 16th century and the rest to the early 17th century. 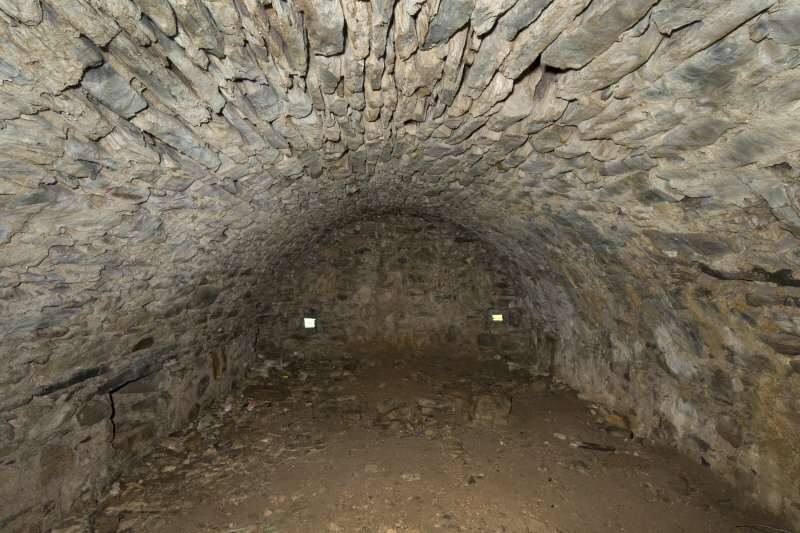 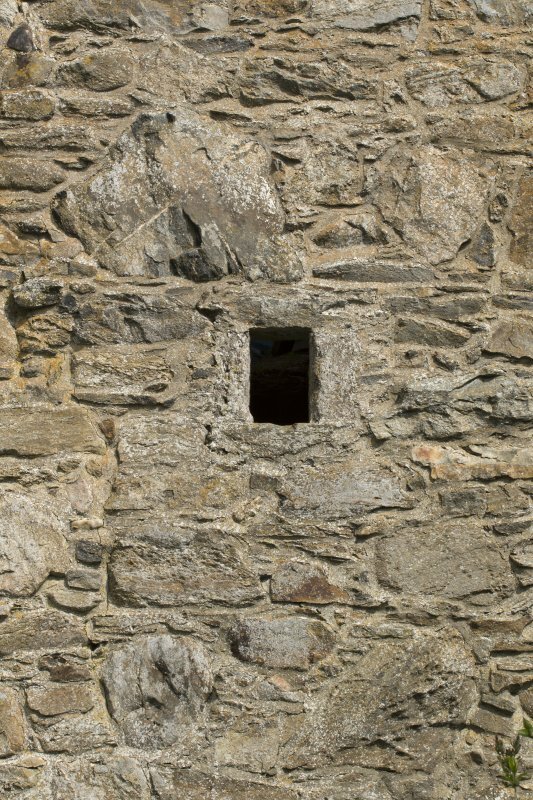 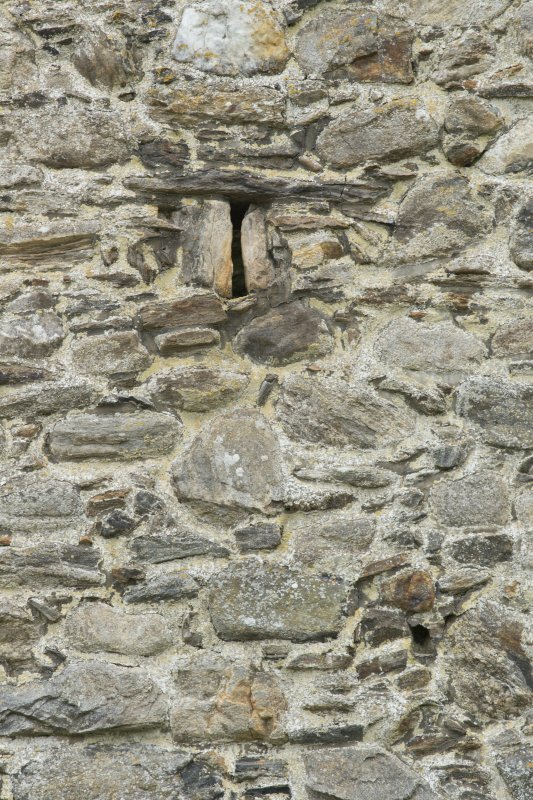 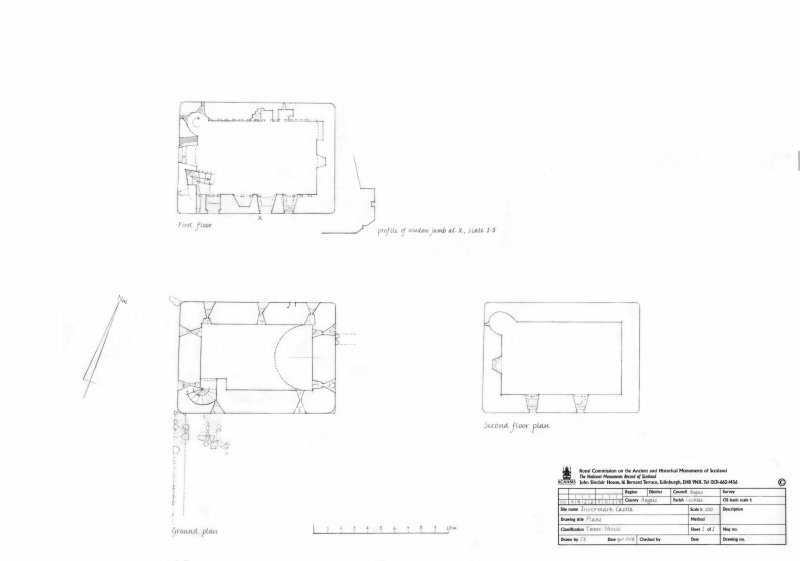 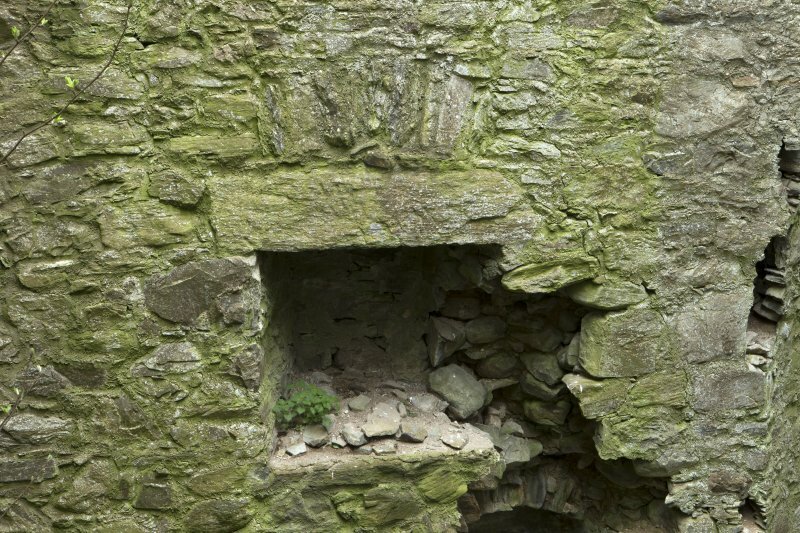 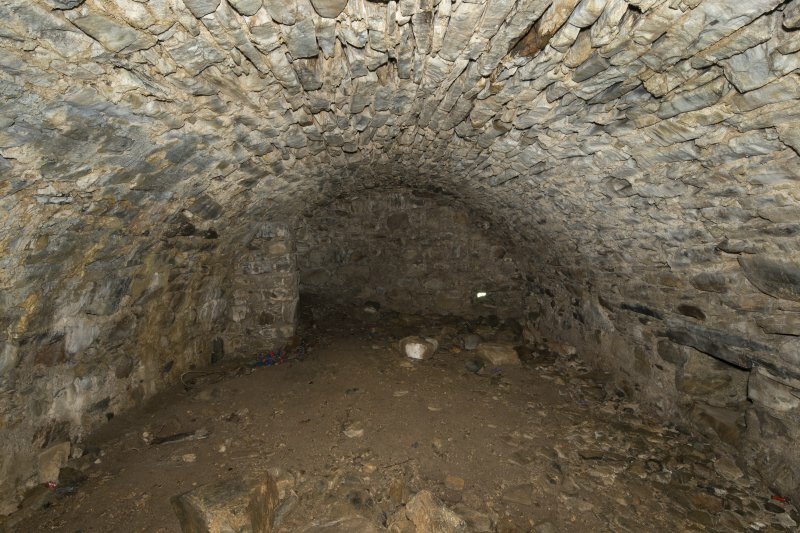 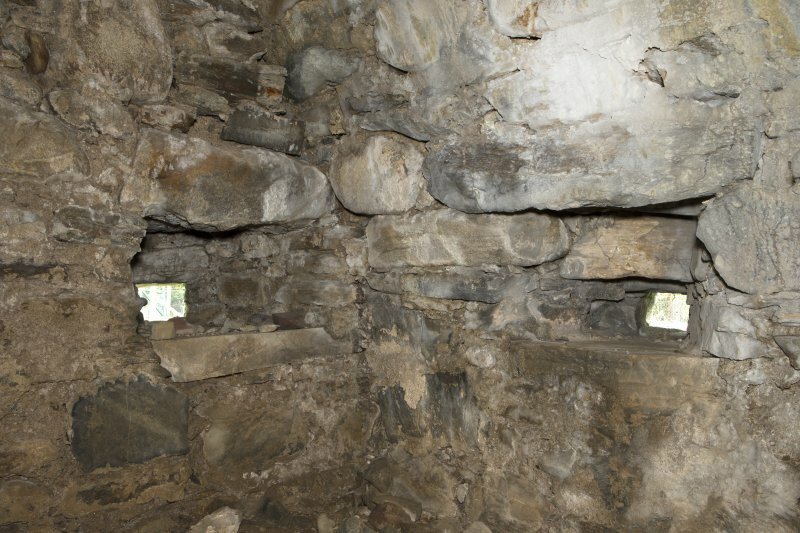 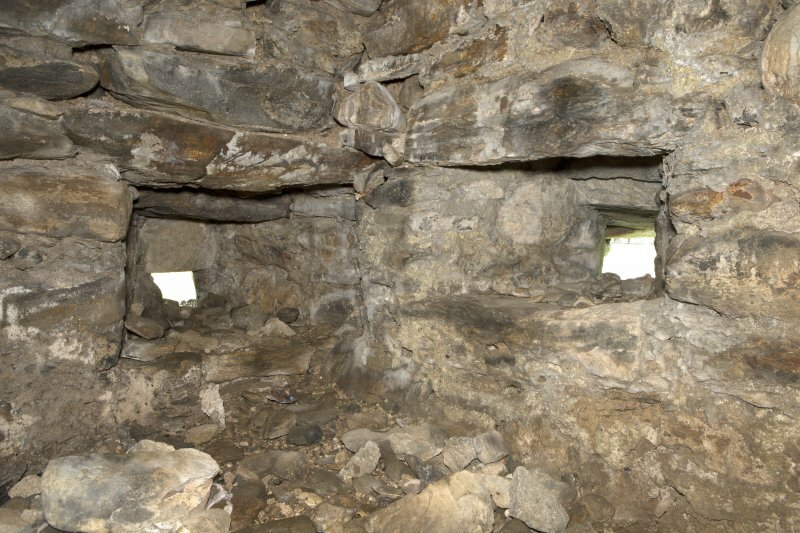 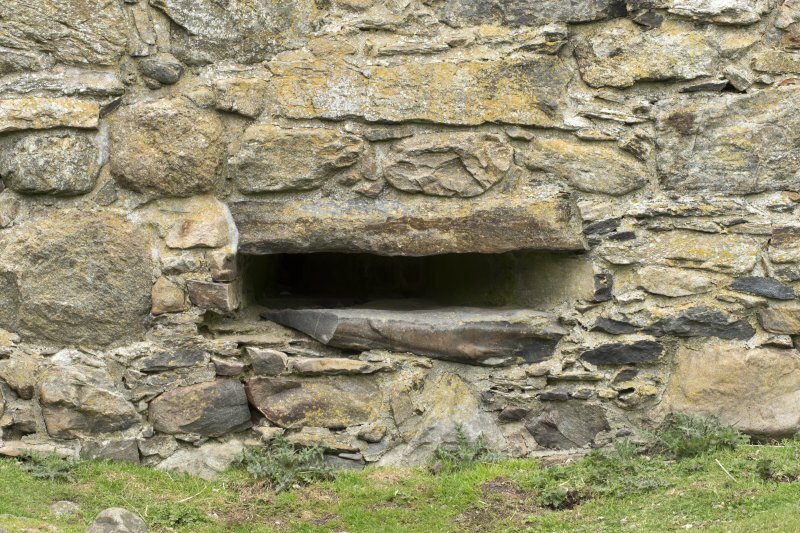 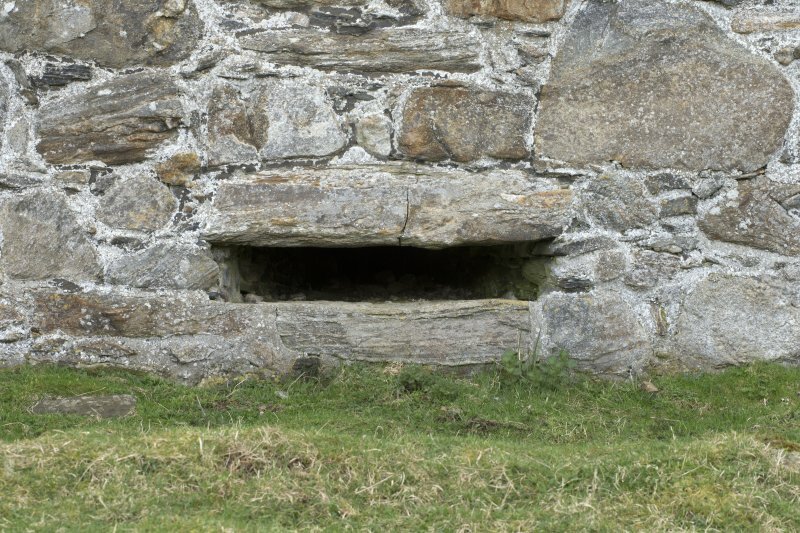 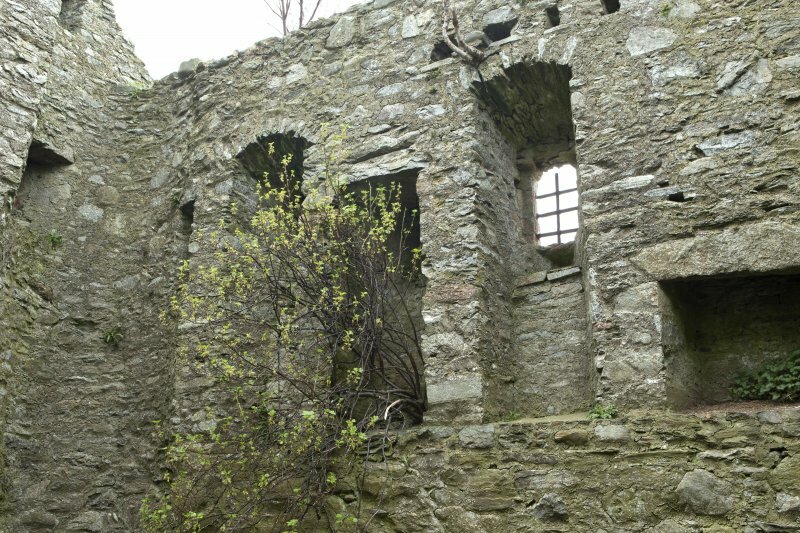 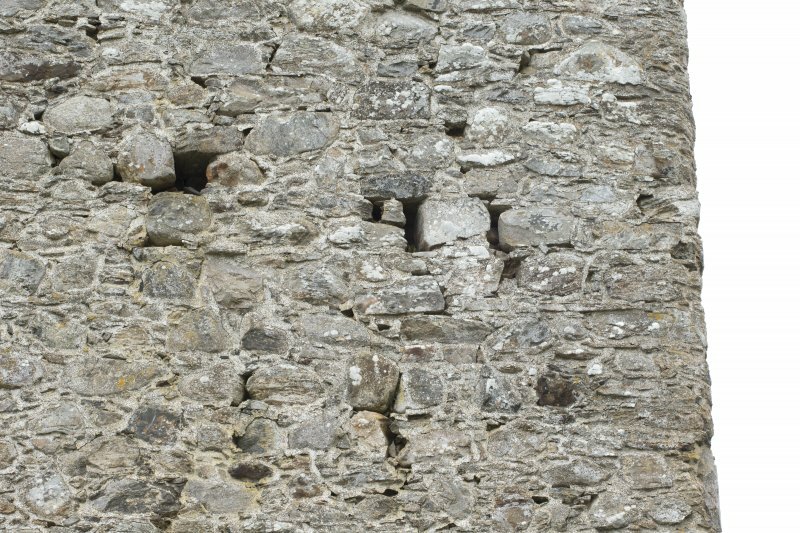 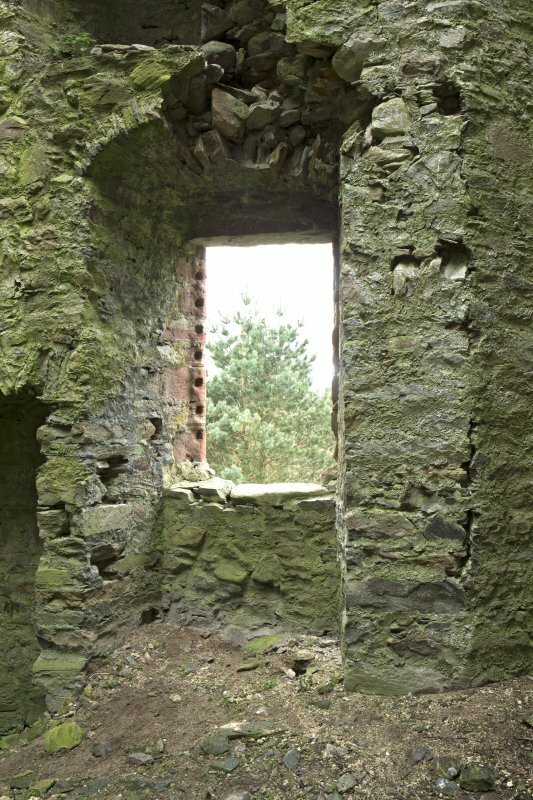 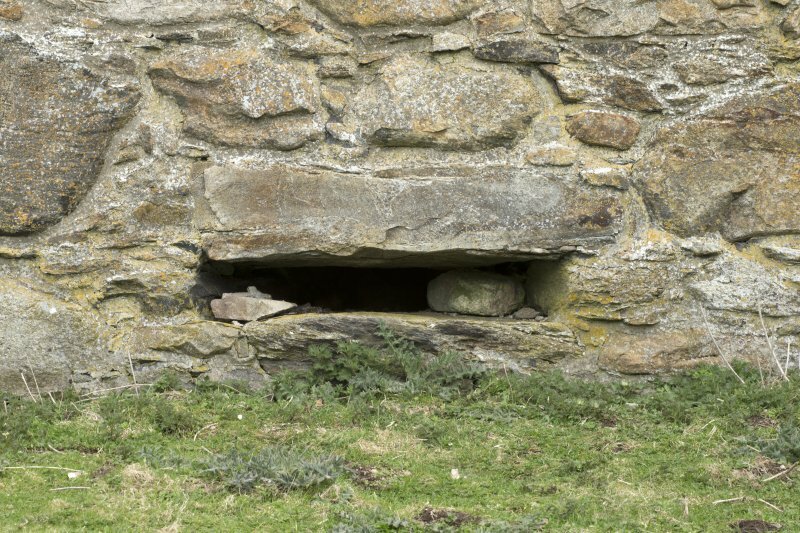 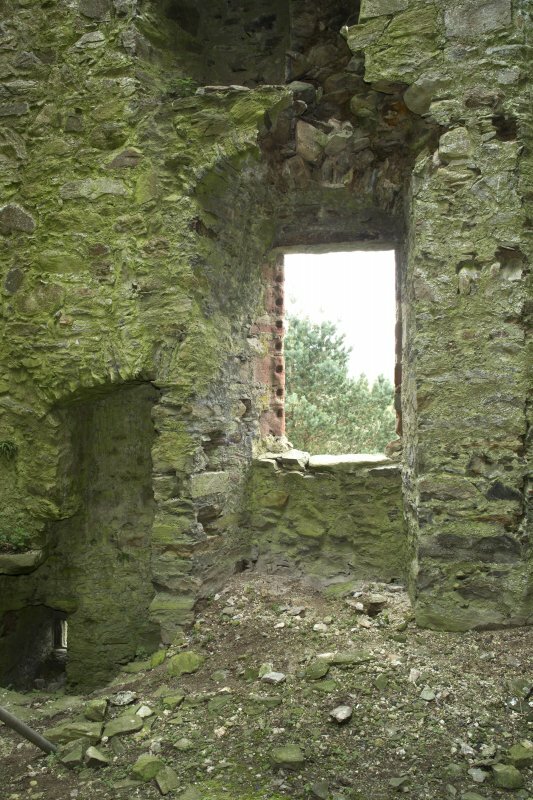 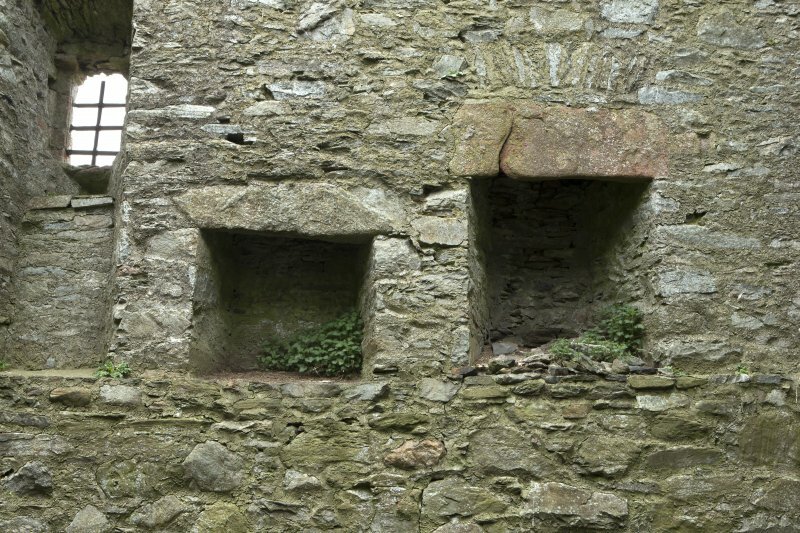 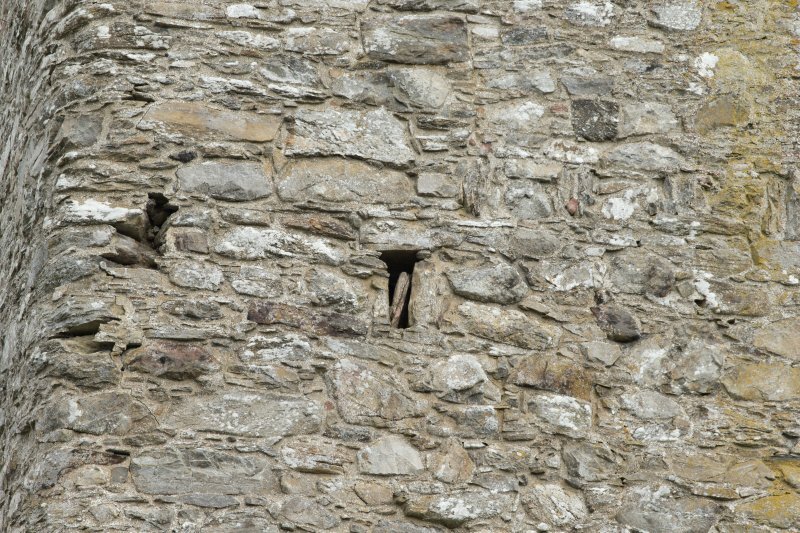 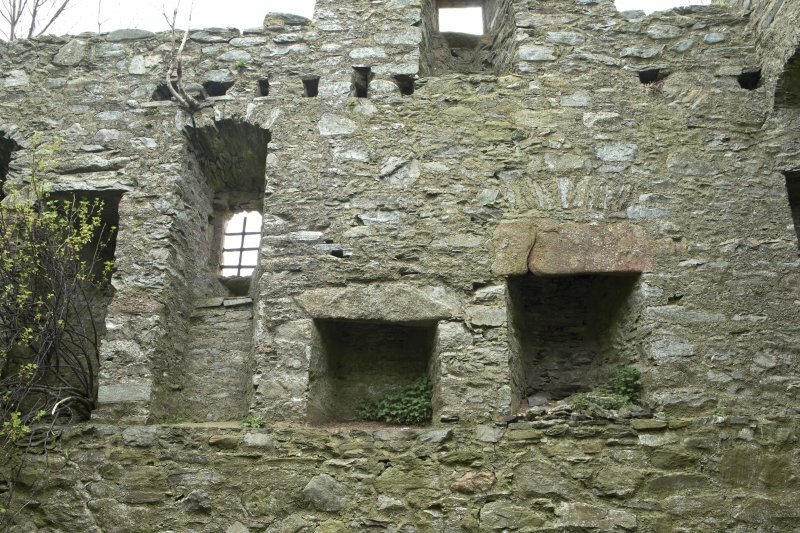 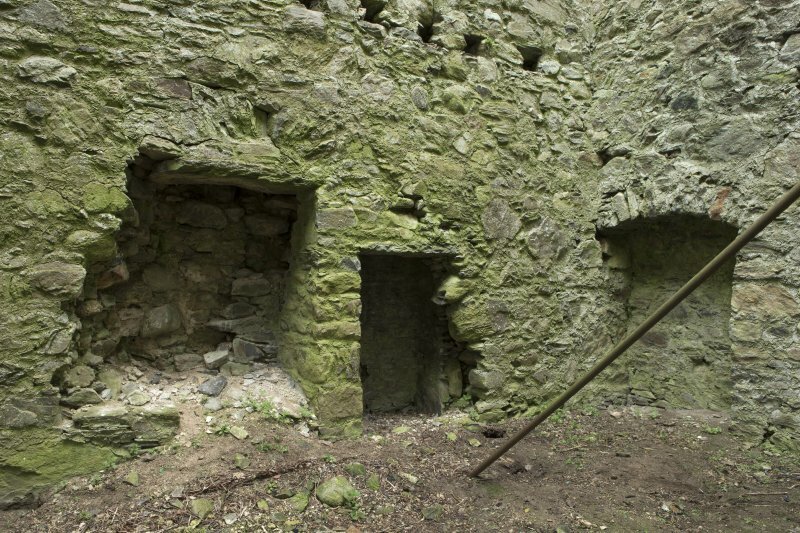 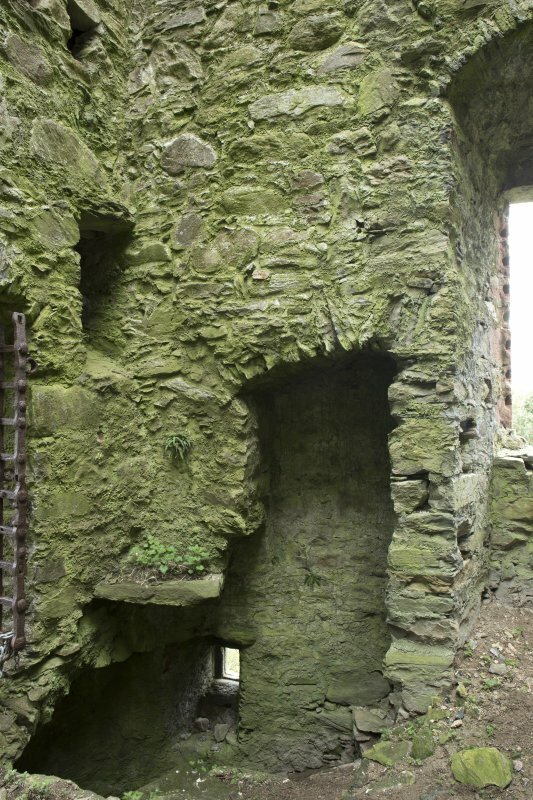 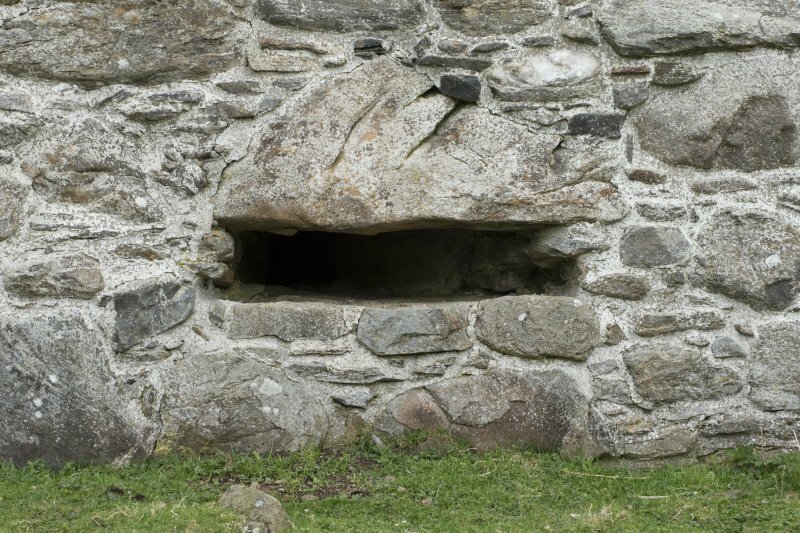 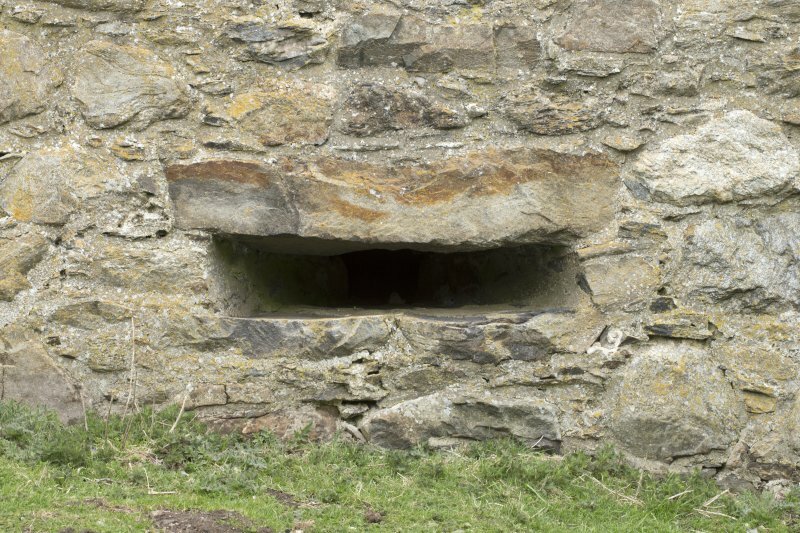 To the south and east of the tower are foundations of outbuildings, presumably the source of the material known to have been robbed from the site to build the parish church, after the castle was abandoned in 1803. 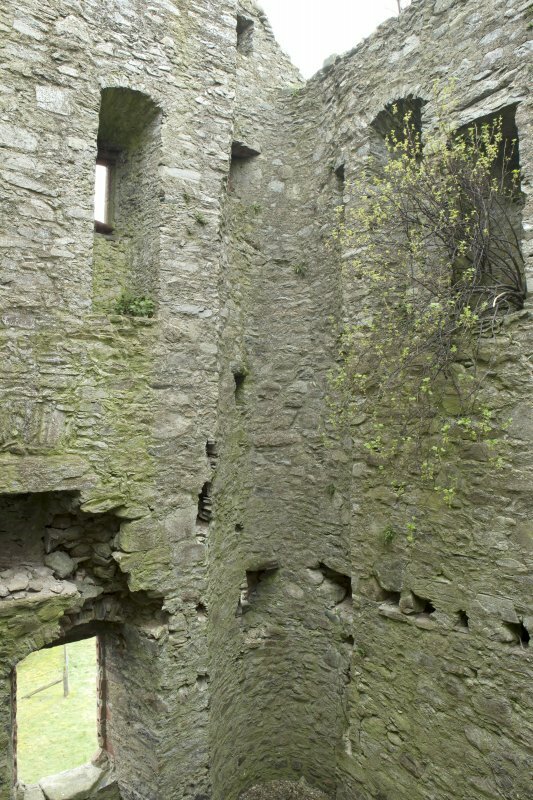 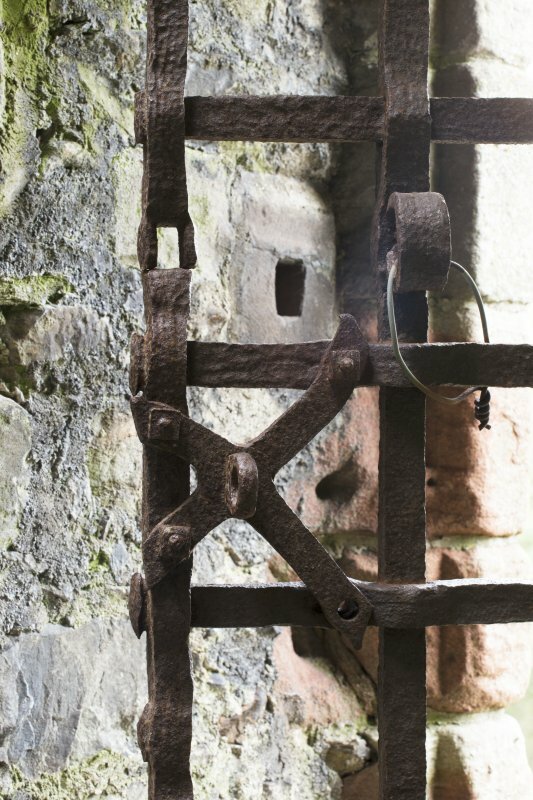 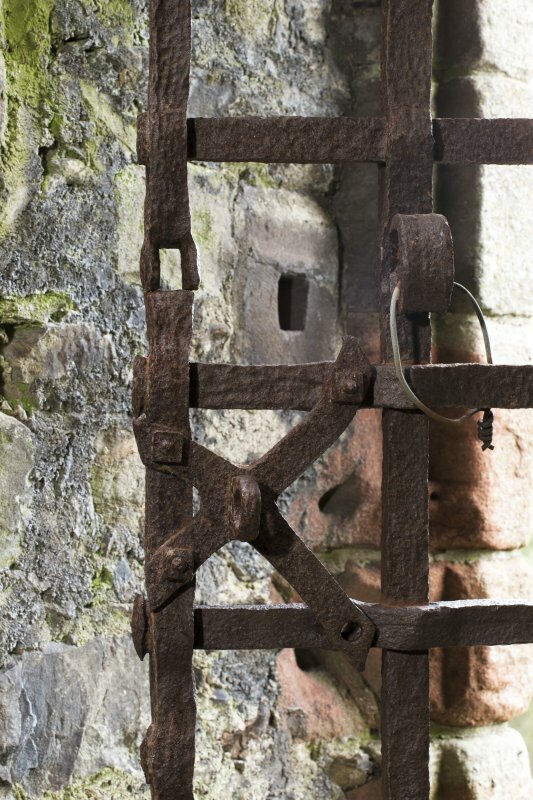 The entrance to the tower, at first floor level, is a round arched doorway which retains its iron yett. 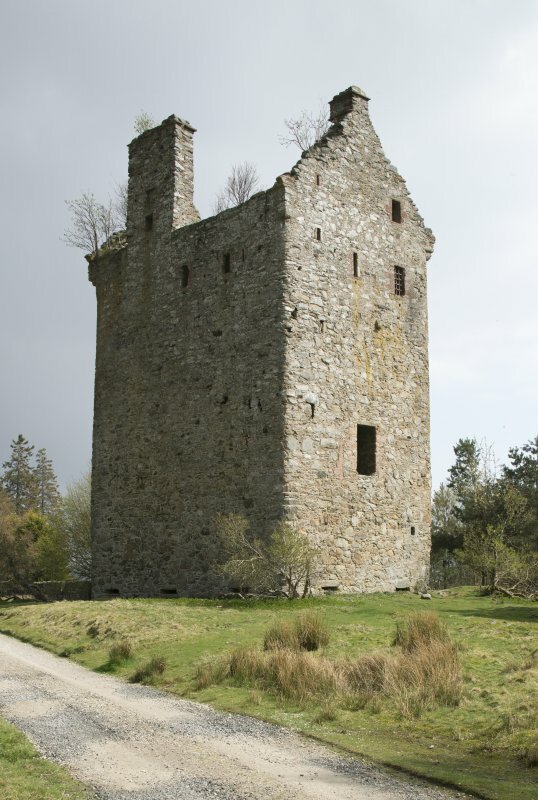 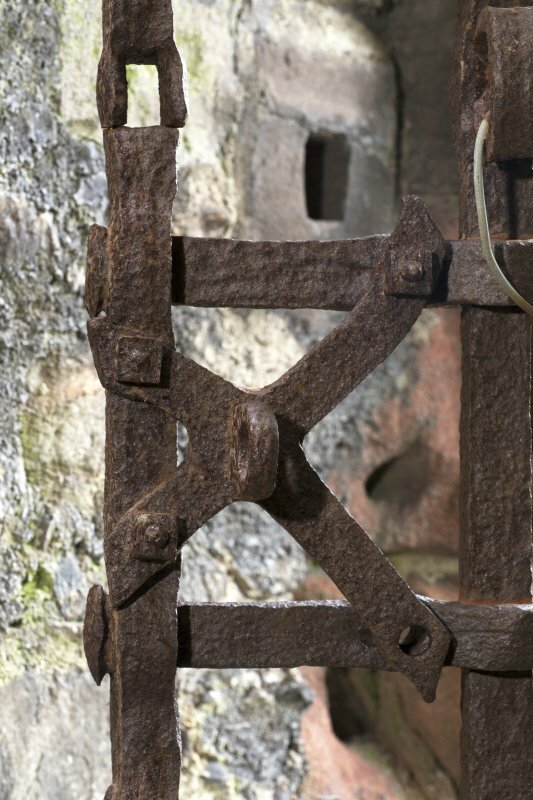 Jervise (1853) suggests that the entrance was reached by means of a drawbridge which crossed a moat, and connected with an isolated platform of freestone which stood about 12' in front of the tower. 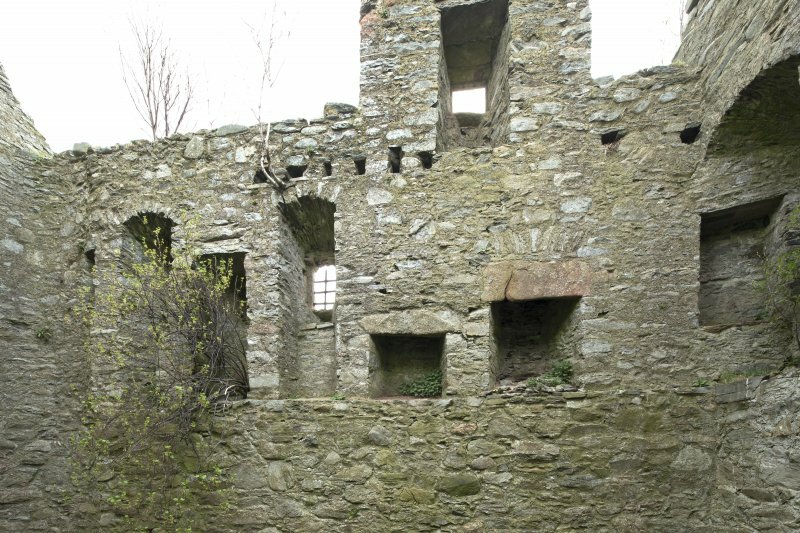 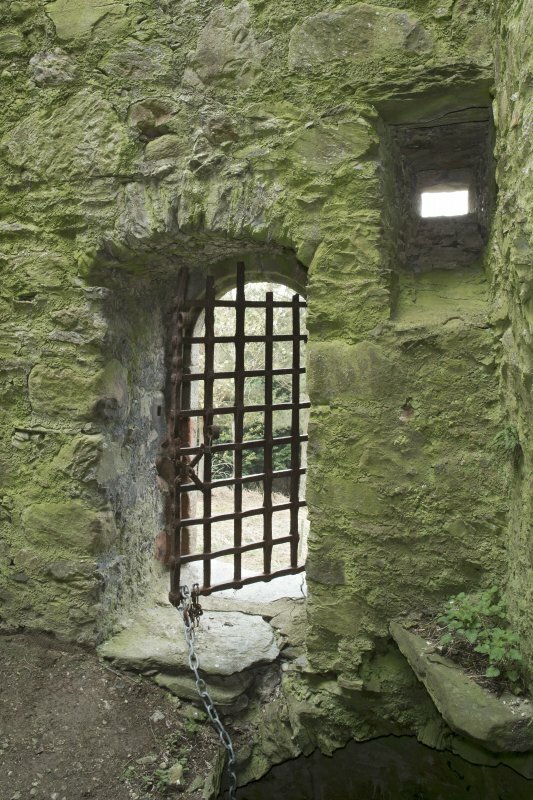 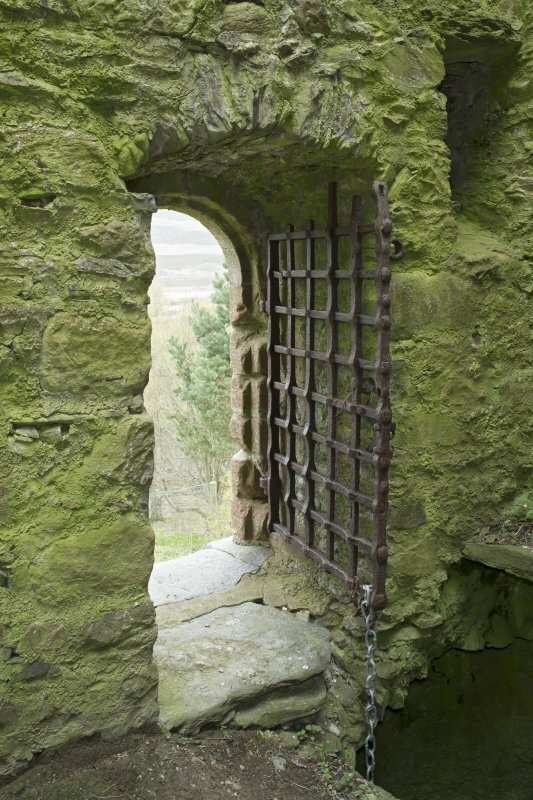 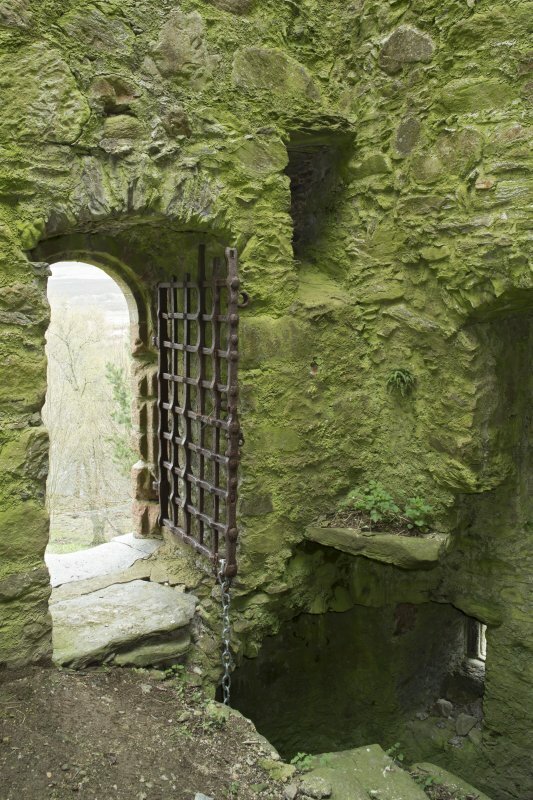 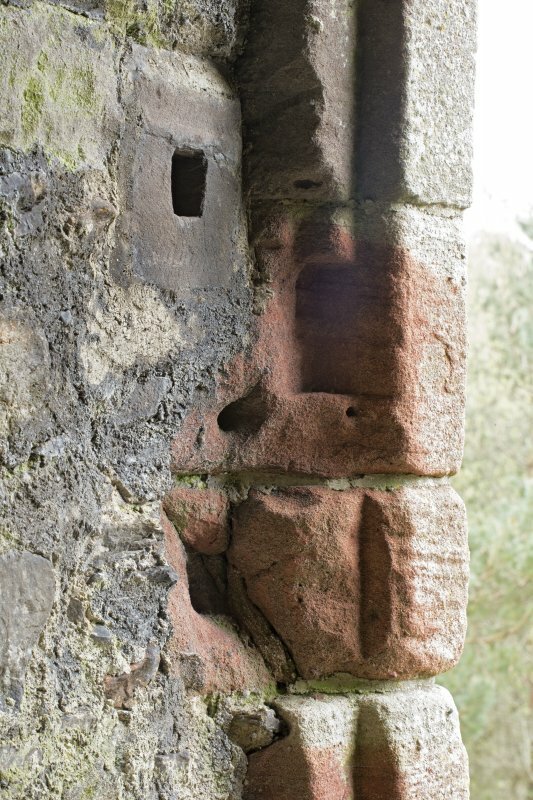 He also says that part of the moat remained on the west side of the hillock on which the castle stands, but this may belong to an earlier castle known to have occupied the site in the 14th century. 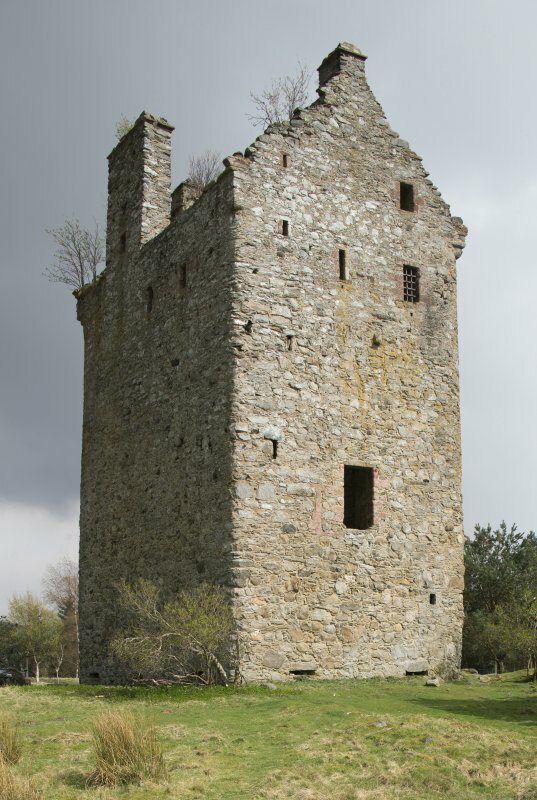 There are traces of a metalled trackway leading from the castle westwards up the bank of the river Lee, between it and the present road. 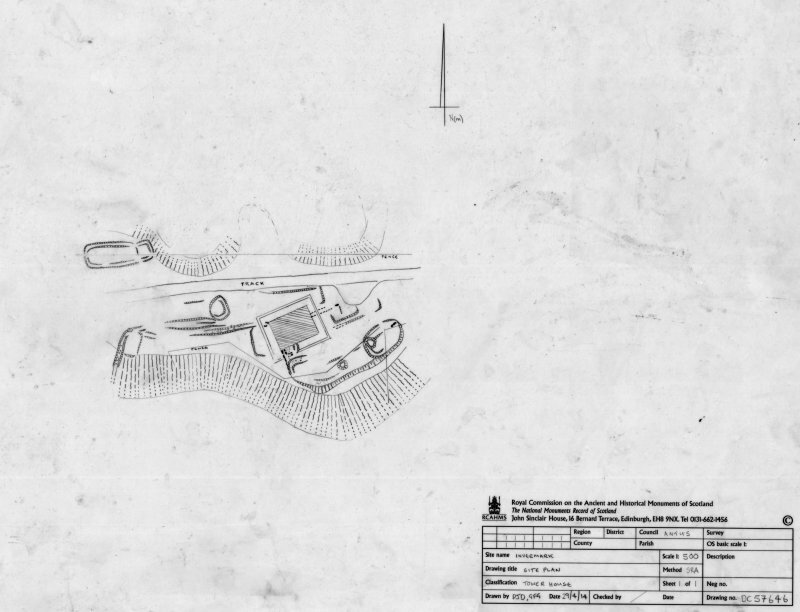 Information from OS (ES) 16 July 1975. 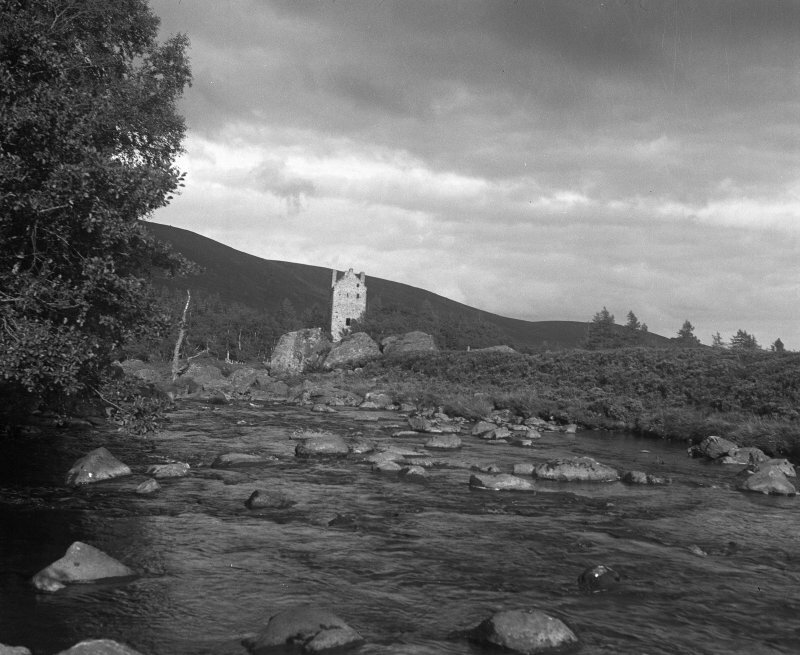 W D Simpson 1934; A Jervise 1853.